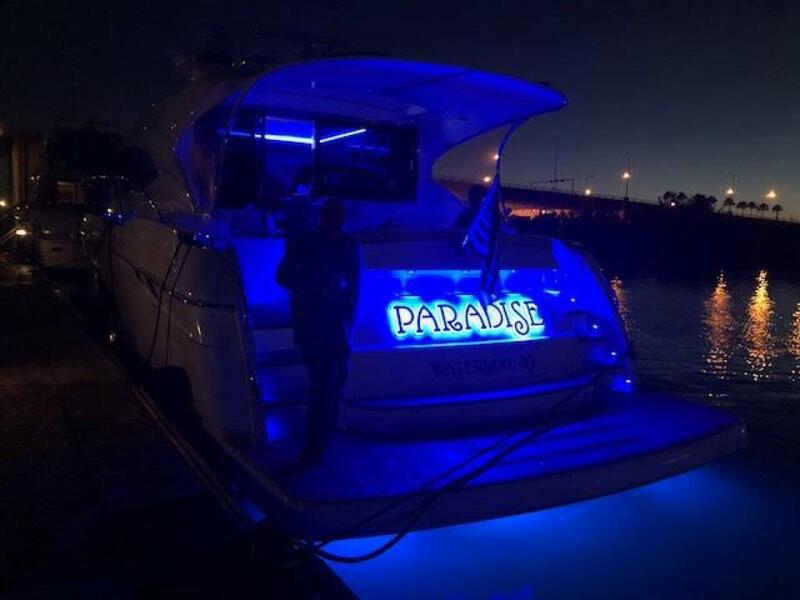 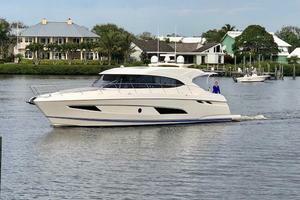 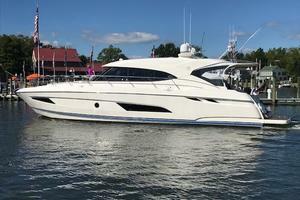 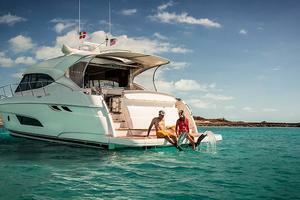 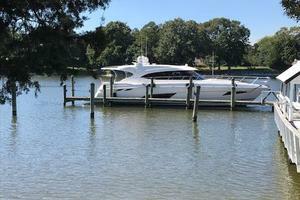 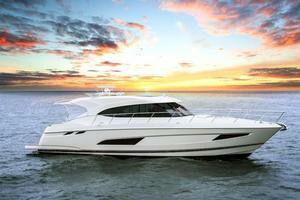 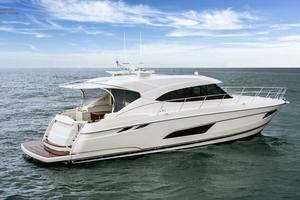 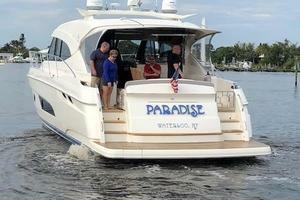 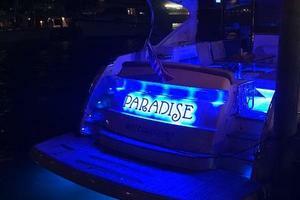 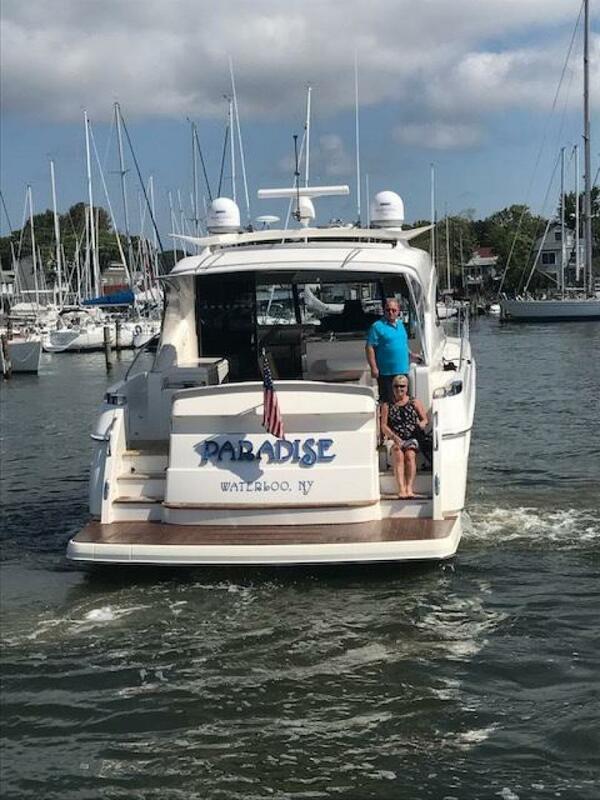 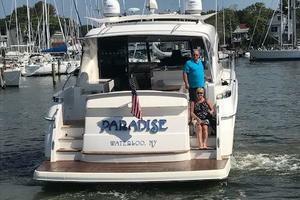 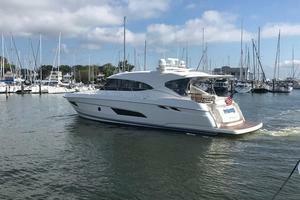 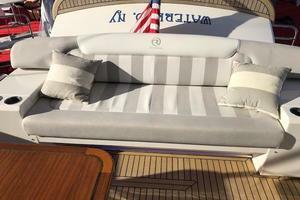 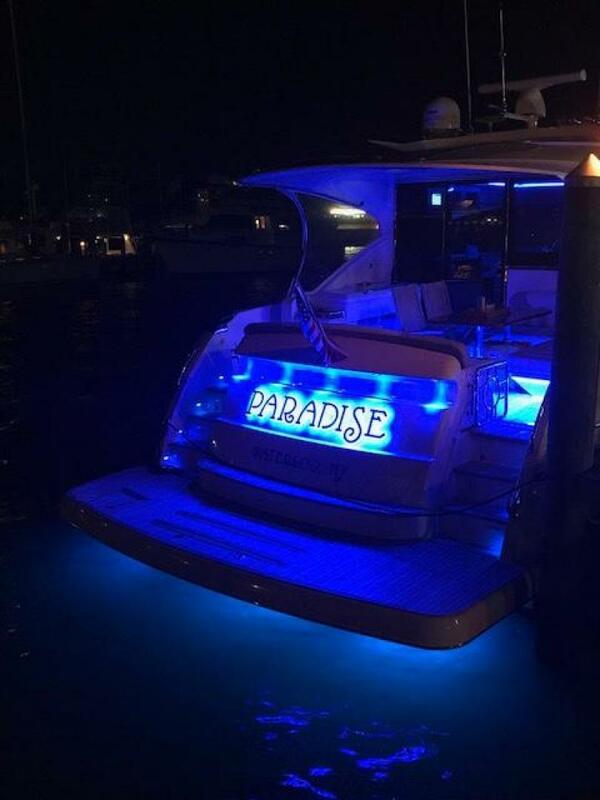 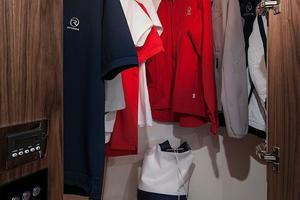 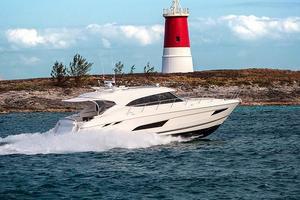 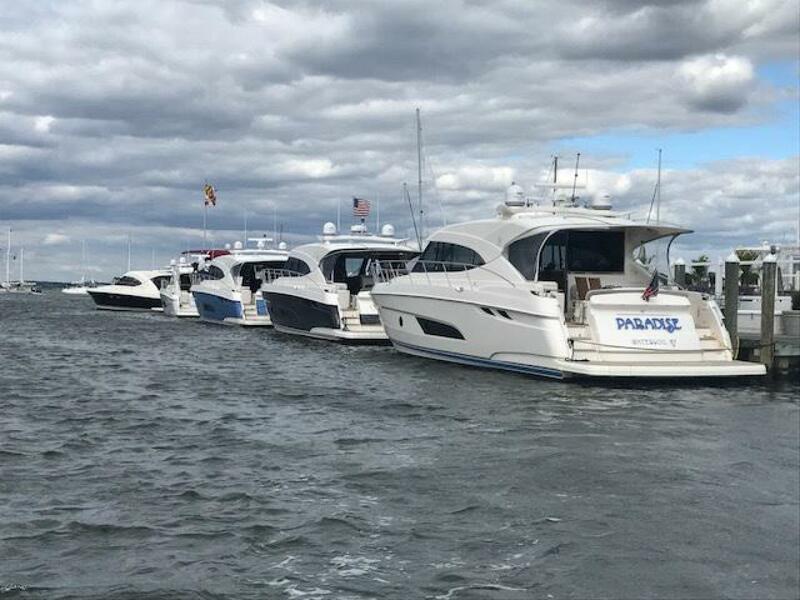 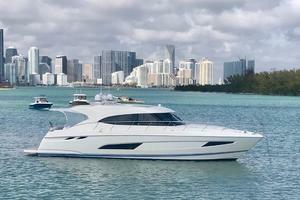 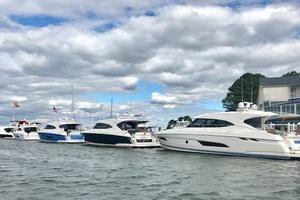 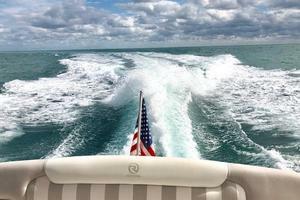 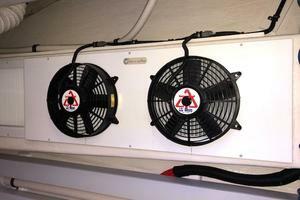 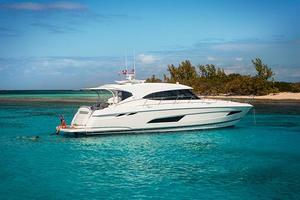 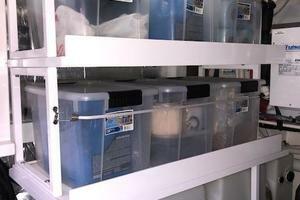 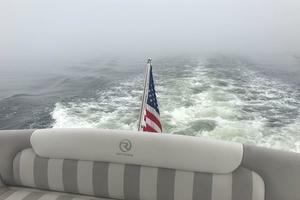 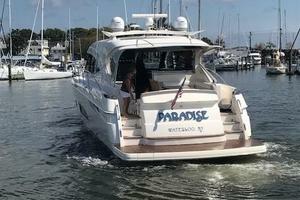 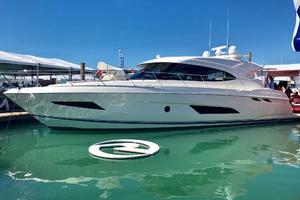 Update: "Paradise" is now in Annapolis to be available for immediate delivery in the Mid-Atlantic this season! 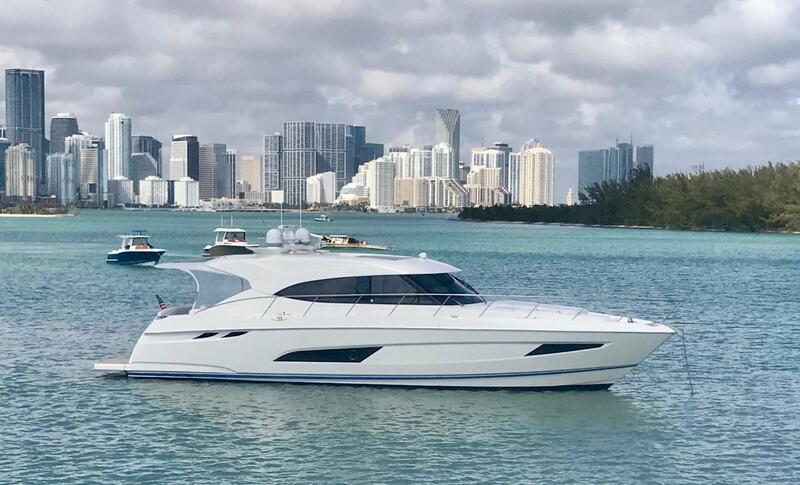 This is the first brokerage 5400 Sport Yacht in the world, a tribute to the 56-boat log already sold to our amazingly loyal clients. 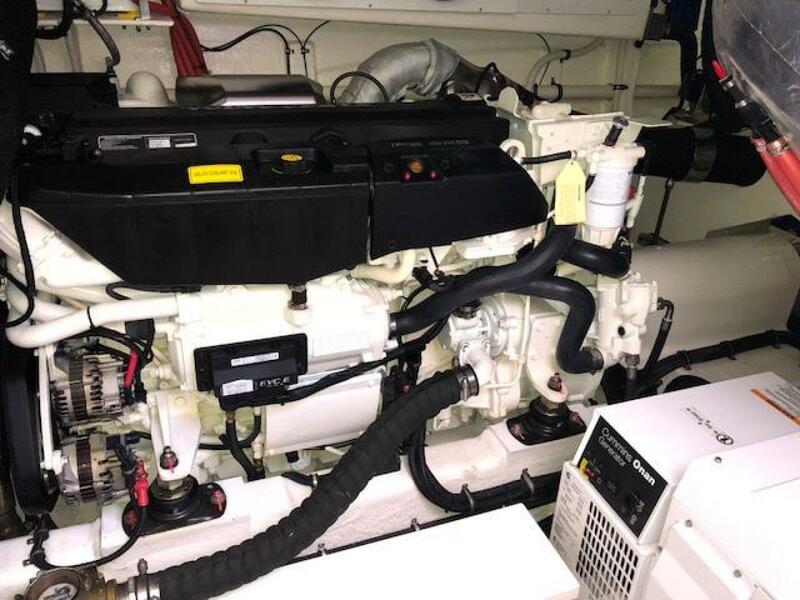 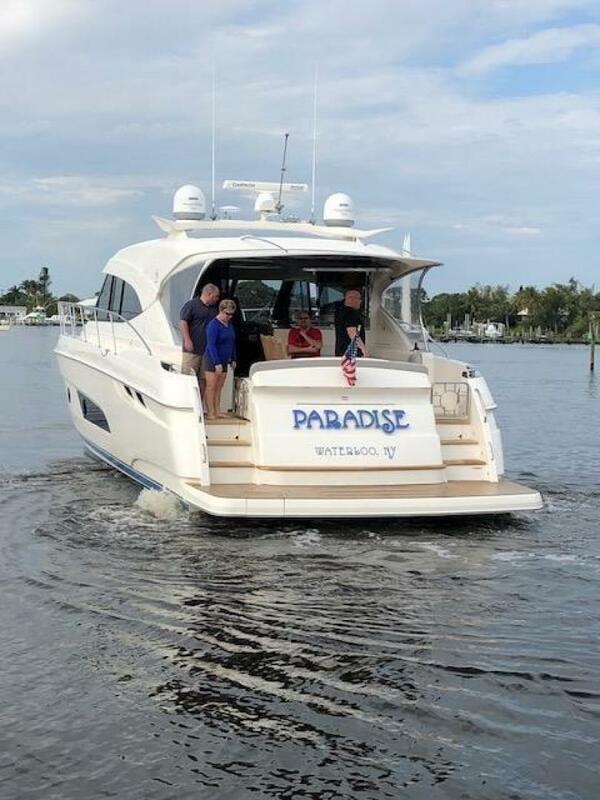 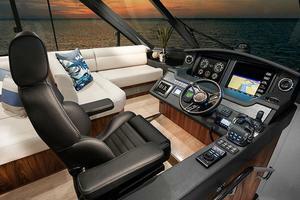 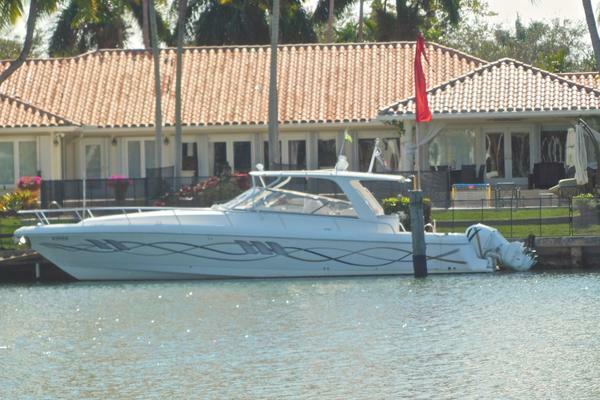 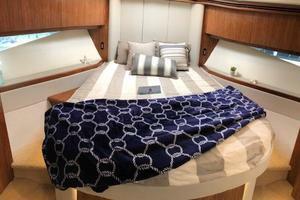 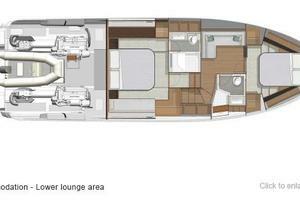 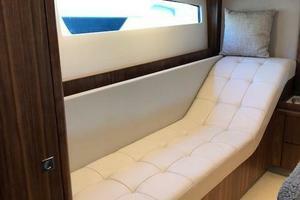 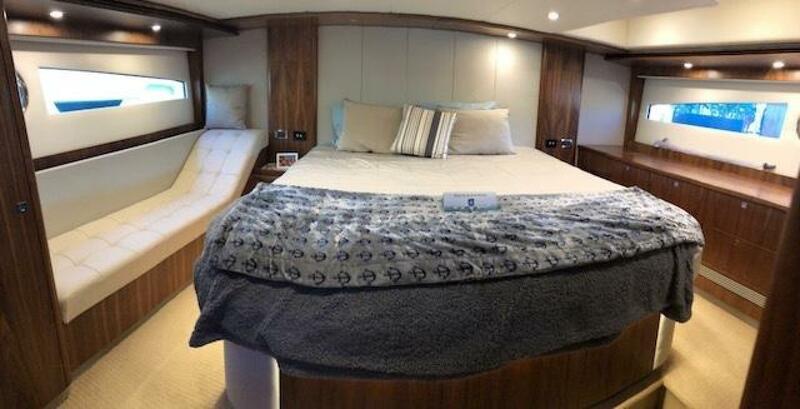 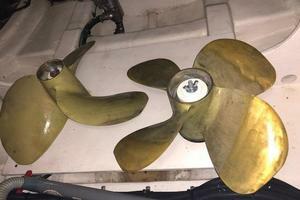 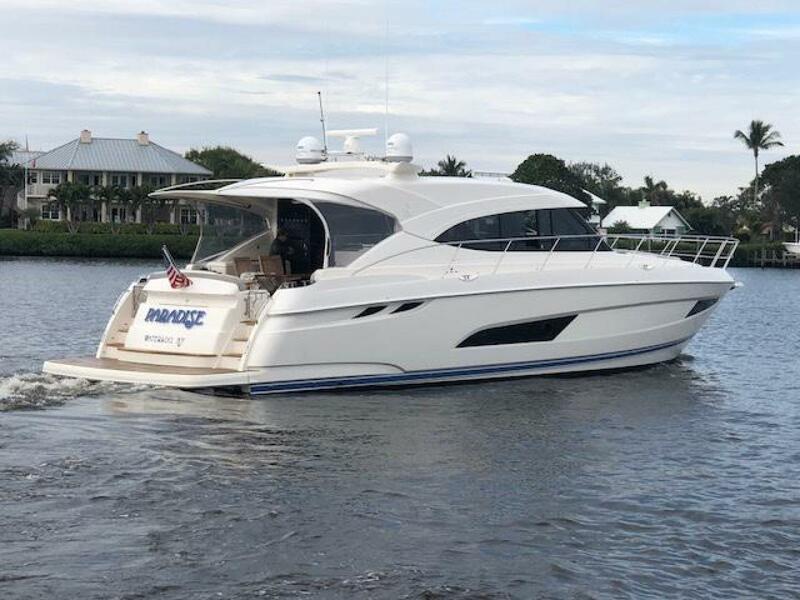 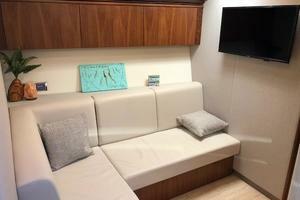 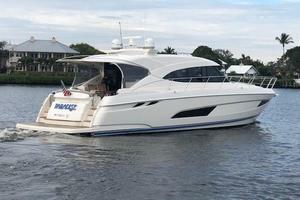 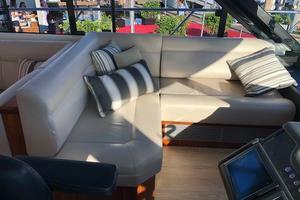 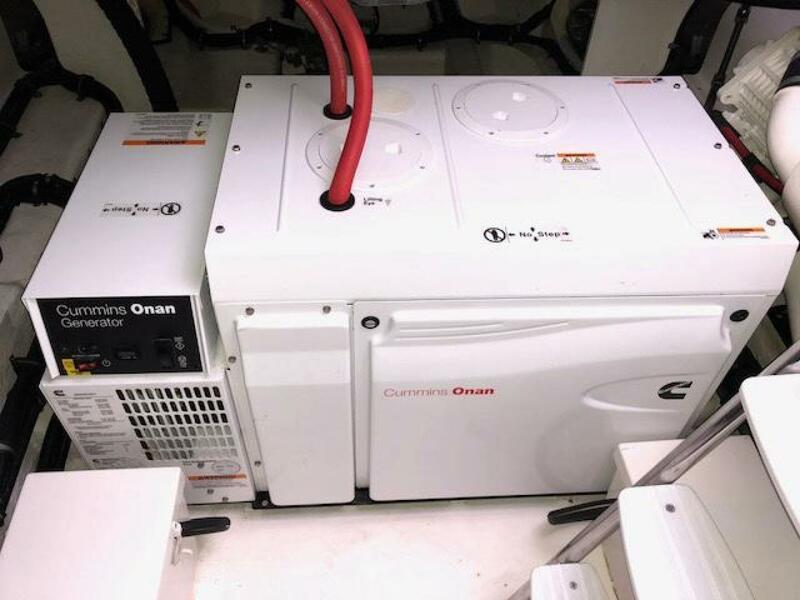 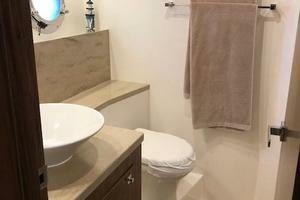 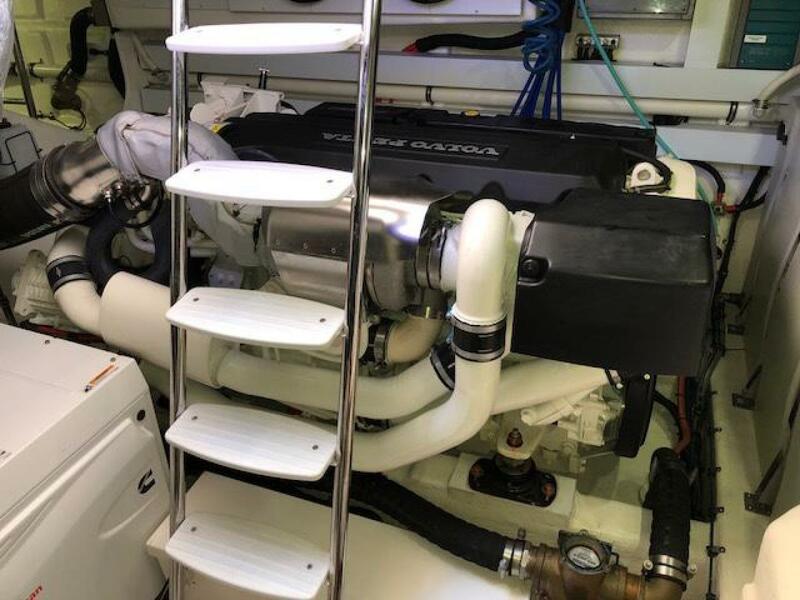 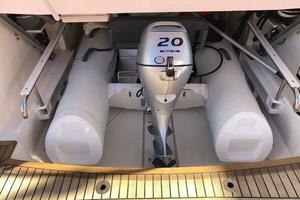 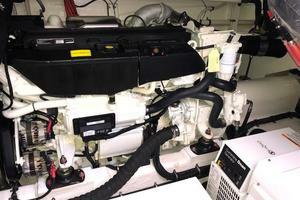 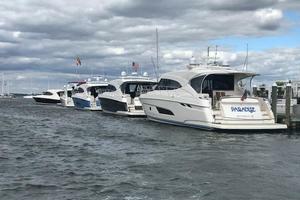 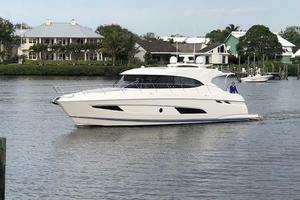 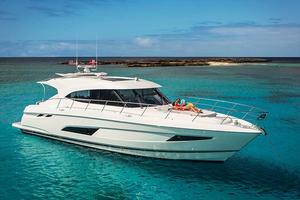 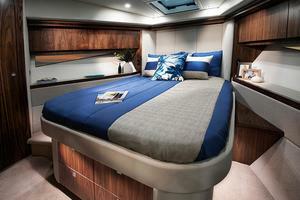 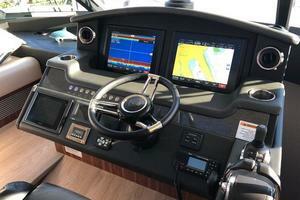 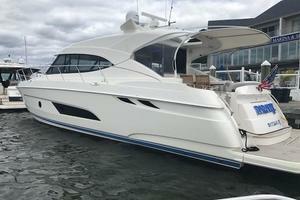 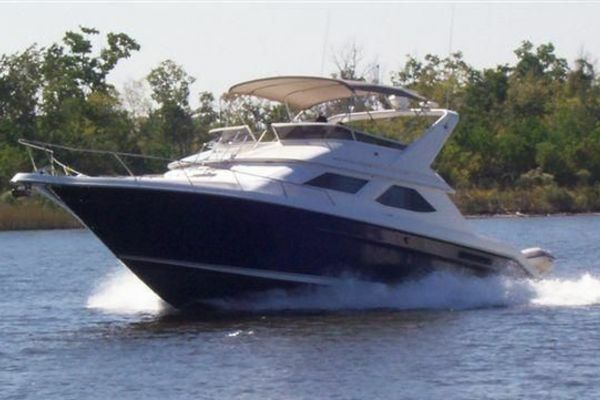 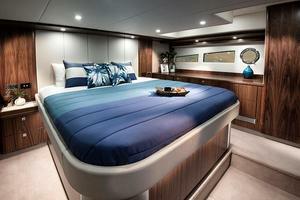 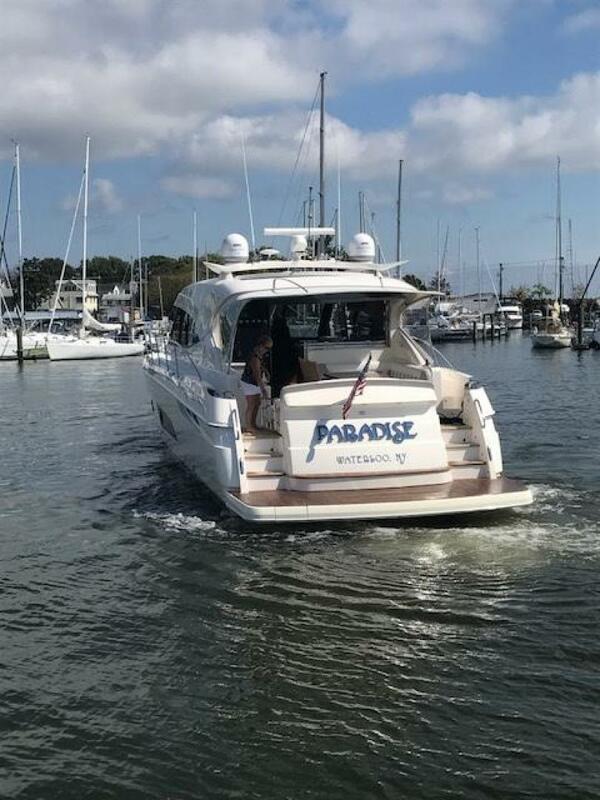 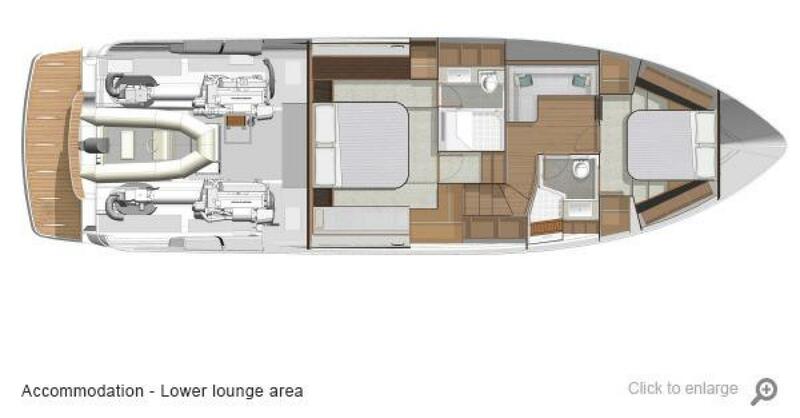 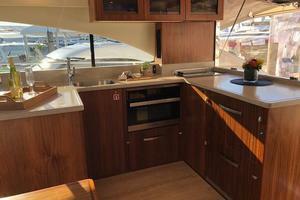 Featuring an optional layout with a lower lounge that converts to a queen berth, Volvo IPS950's with DPS, Trim Assist, and all other factory options under warranty until December 2021, spare props, Sat TV, a garage with a Brig 330 Falcon tender with a 20hp Honda, and so much more, this is an amazing opportunity. We would love to discuss this great opportunity with you. 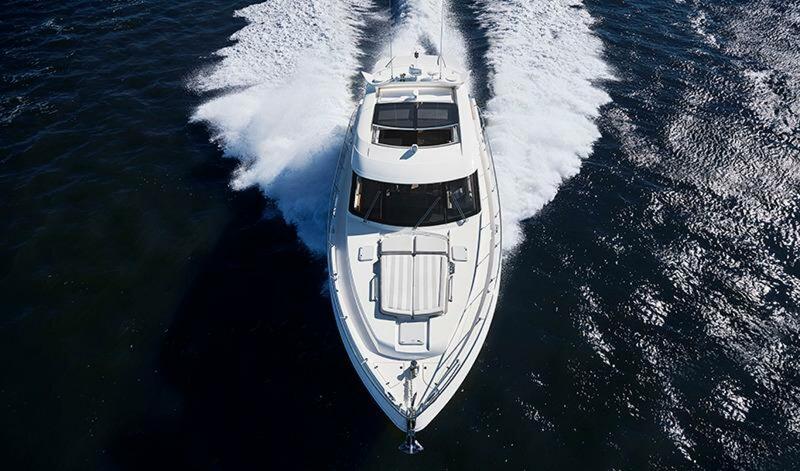 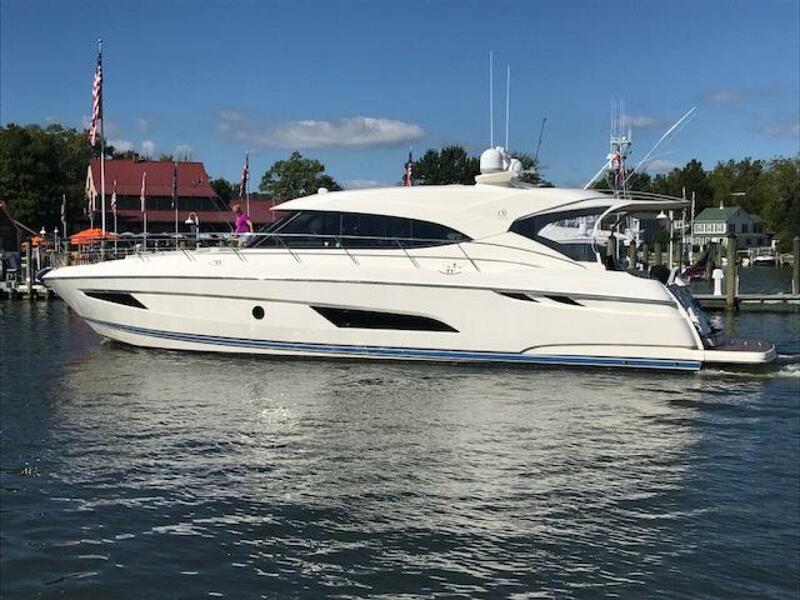 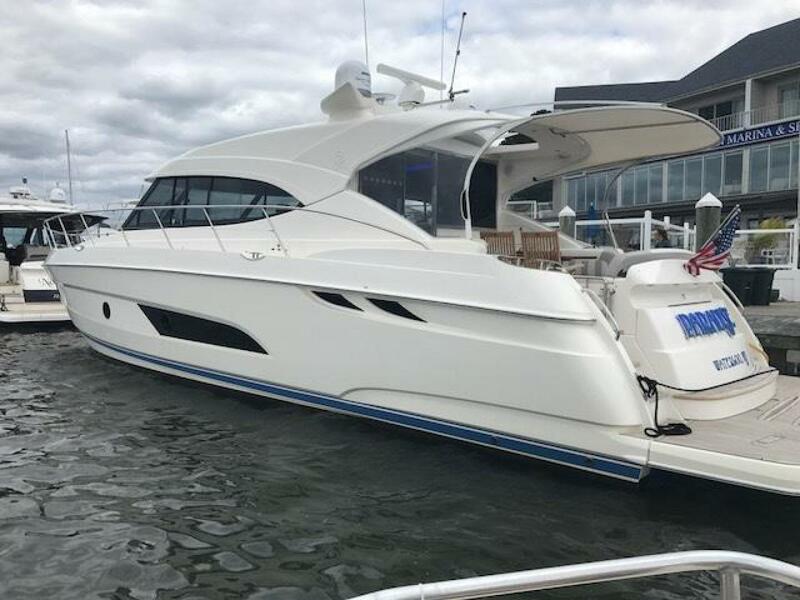 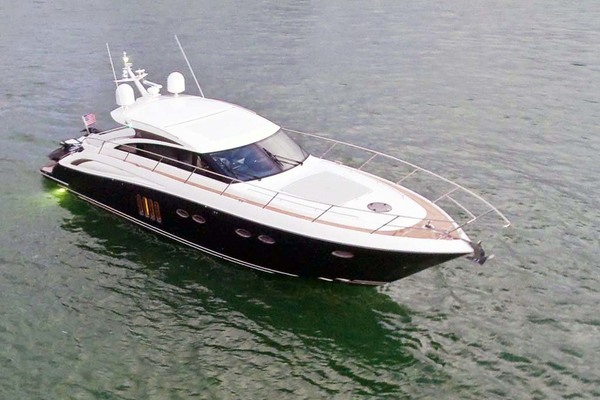 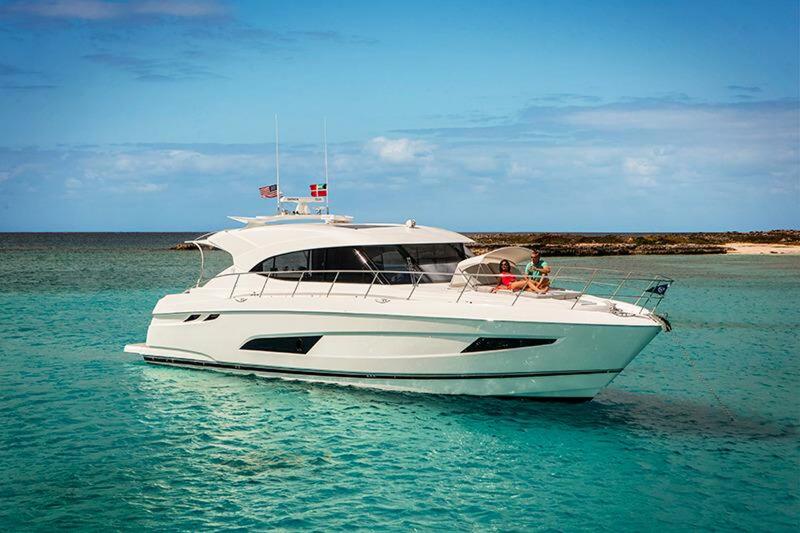 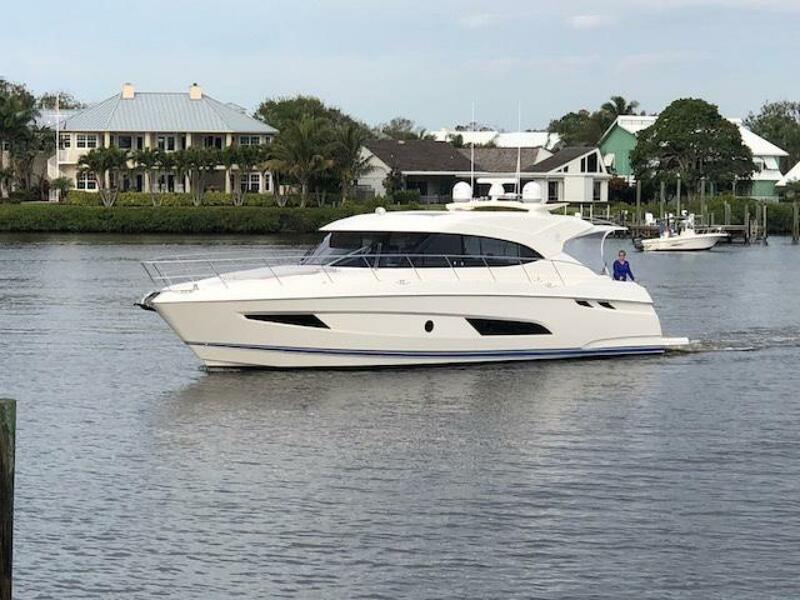 The impressive Riviera 5400 Sport Yacht is the very latest addition to our collection of world-class Sport Yachts that are proving so popular in every corner of the world. 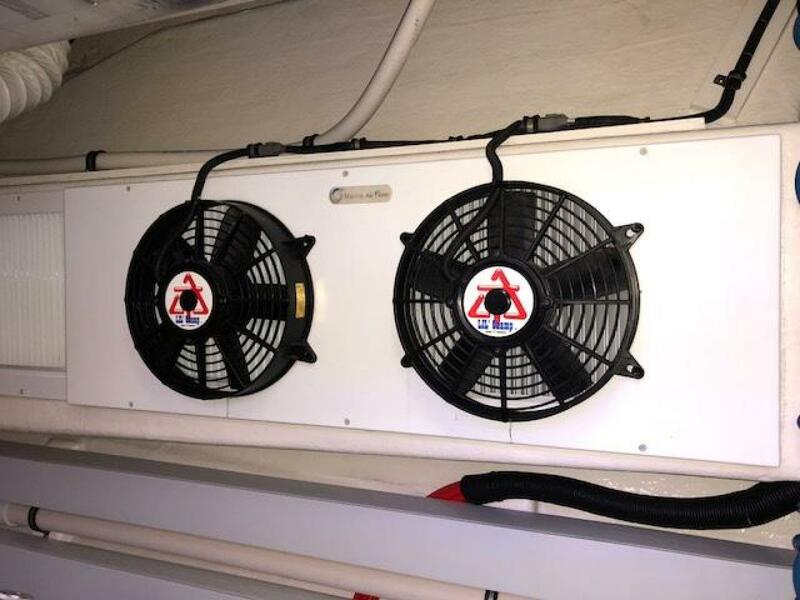 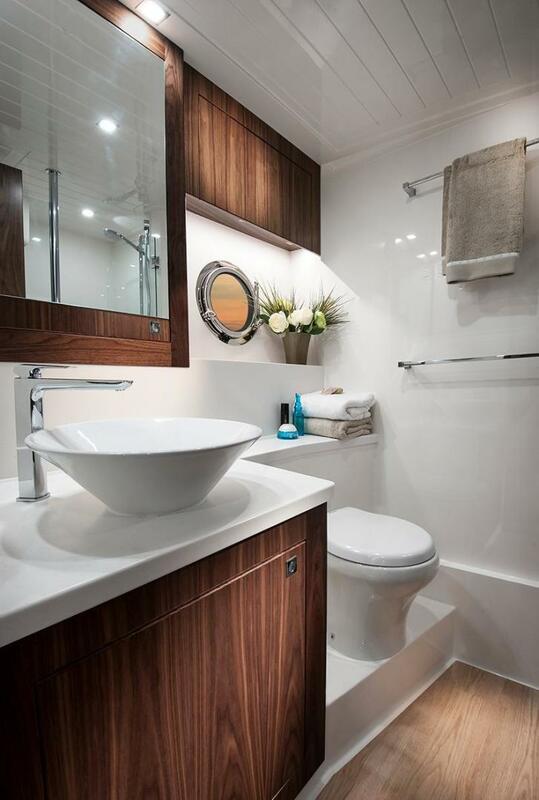 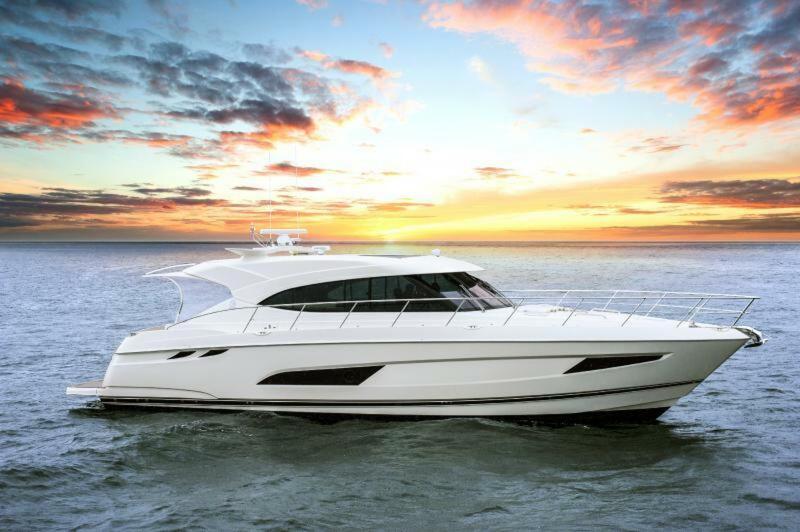 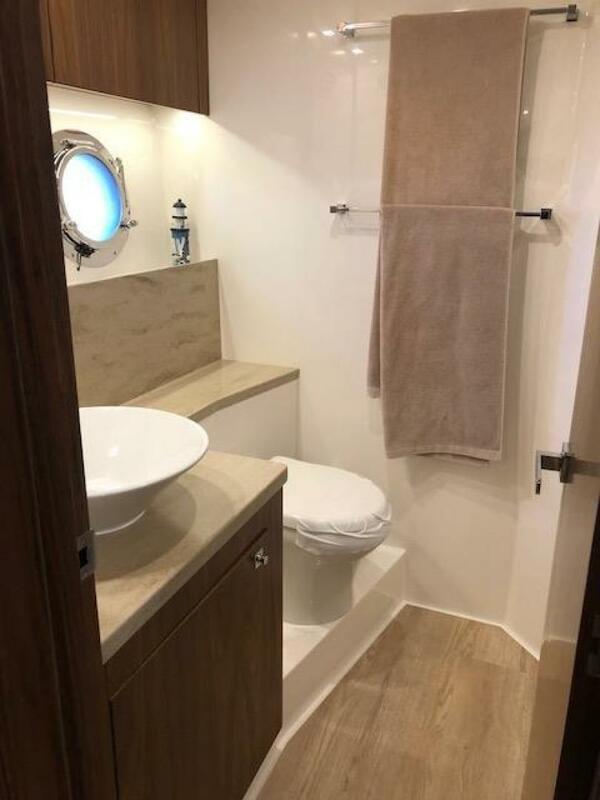 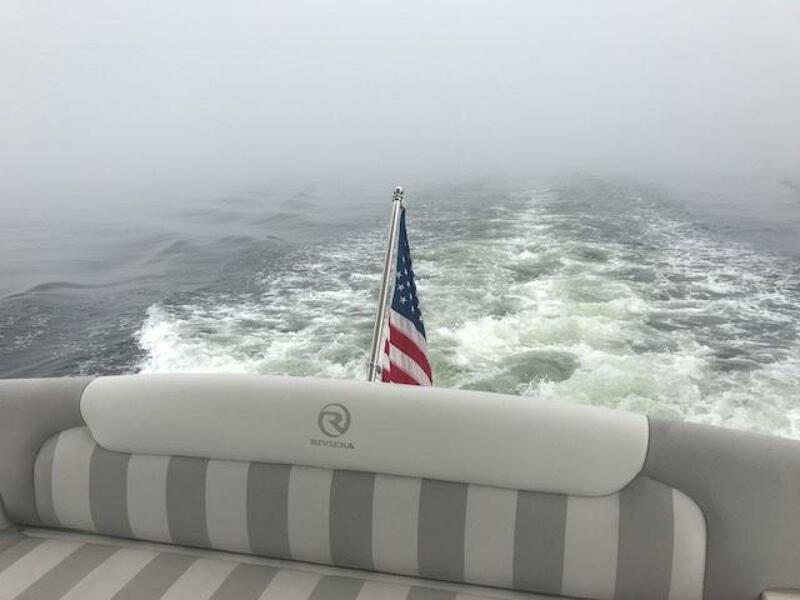 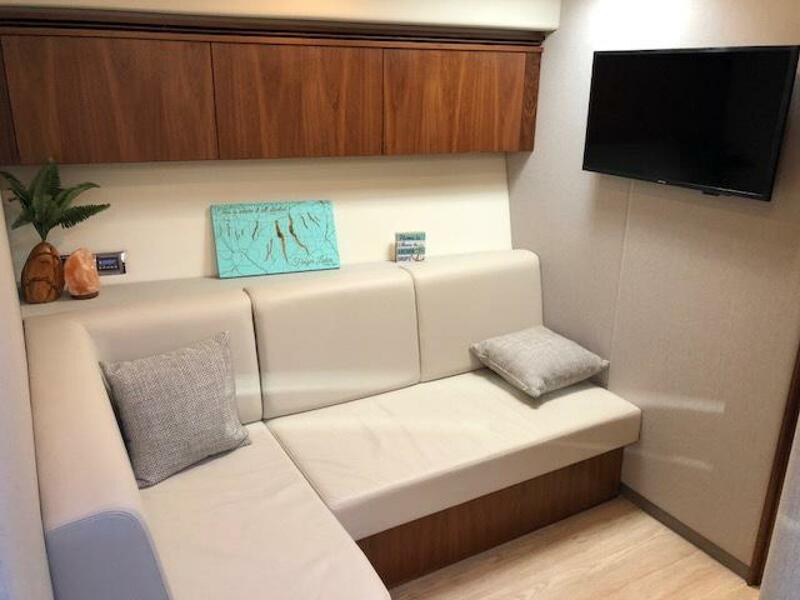 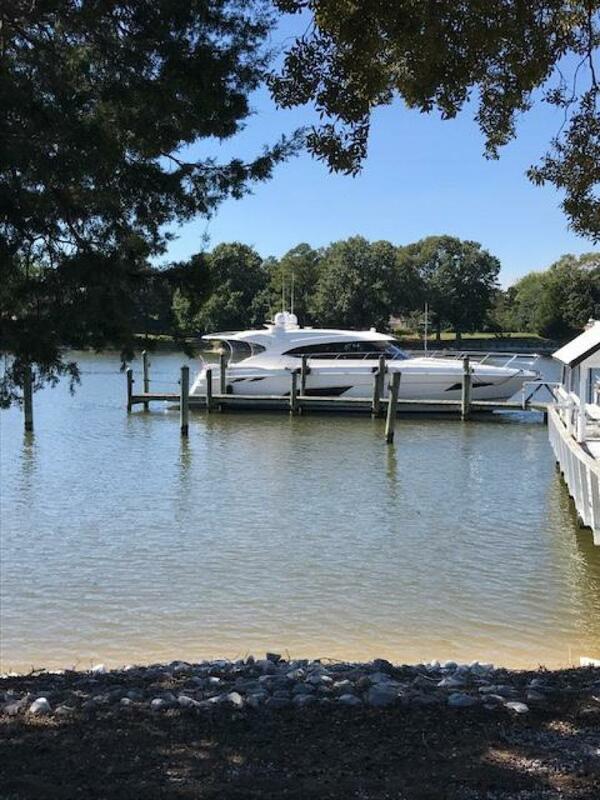 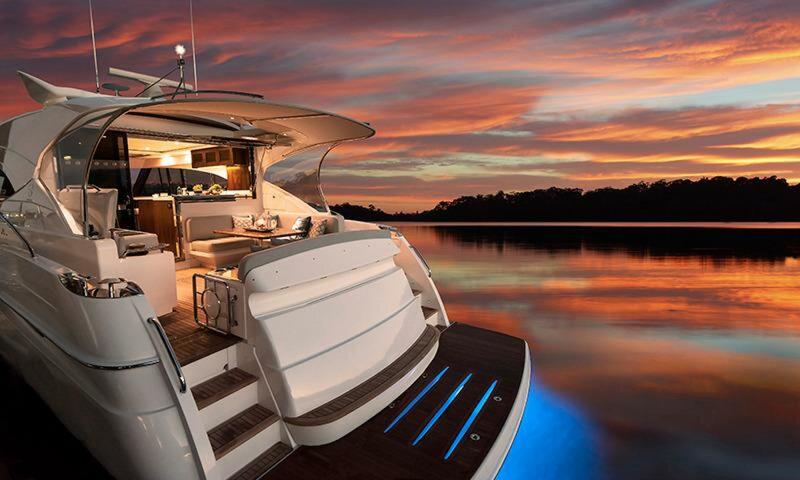 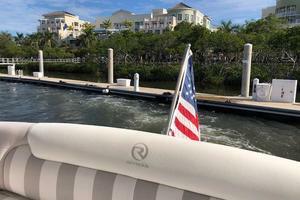 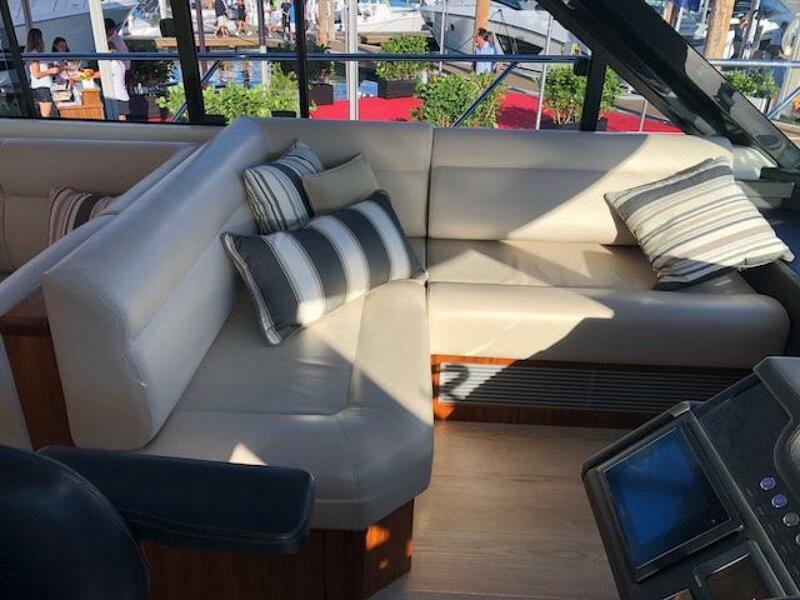 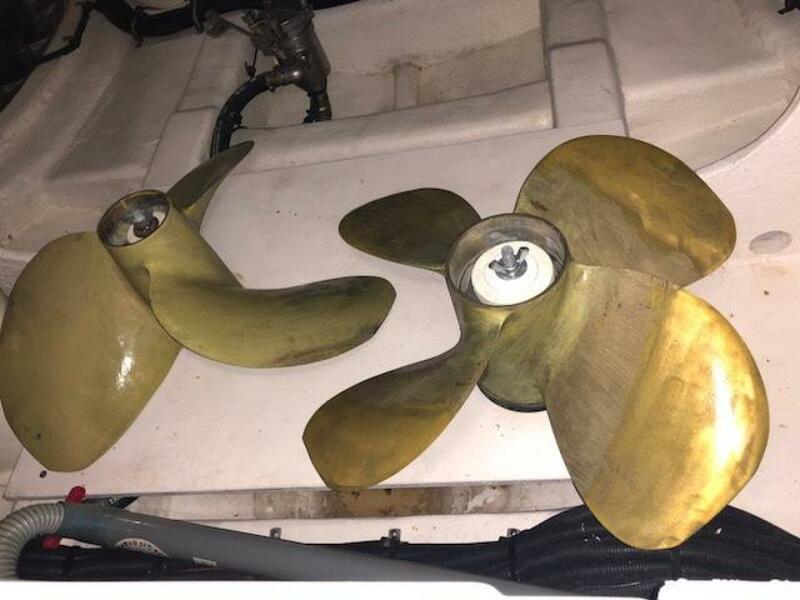 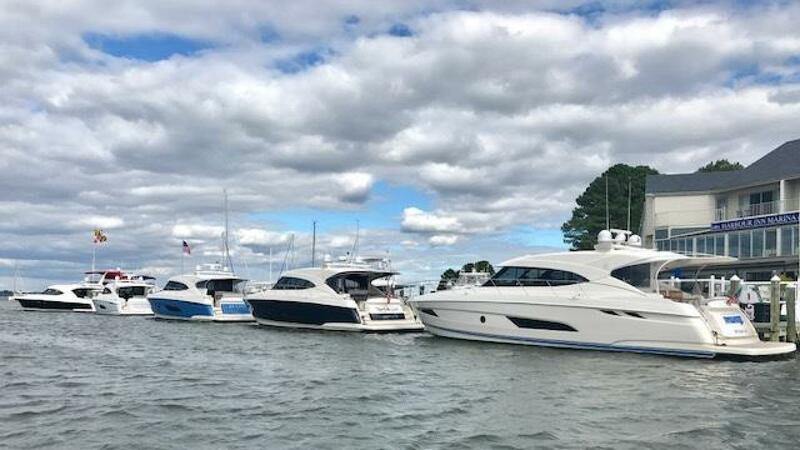 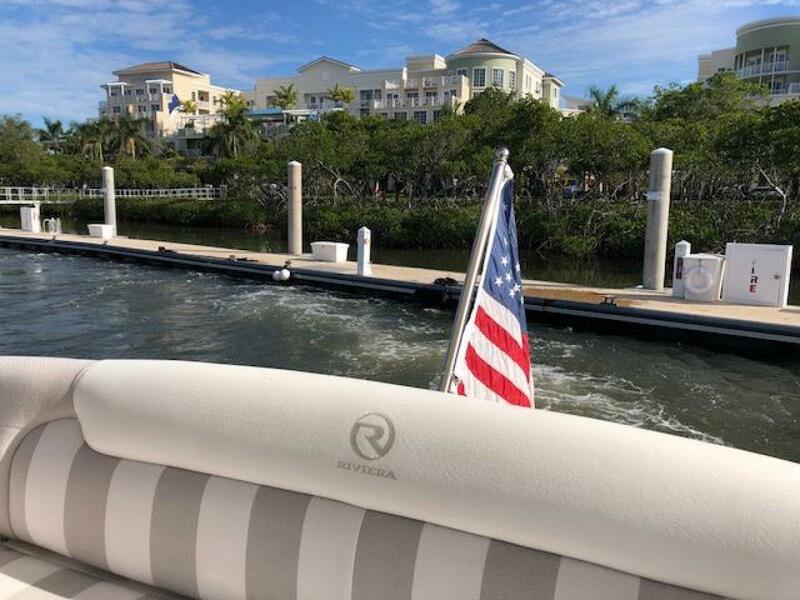 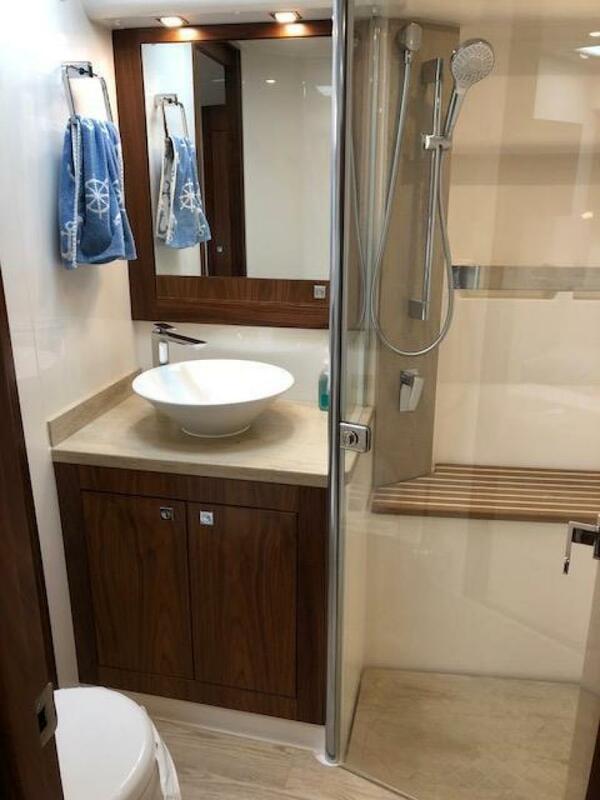 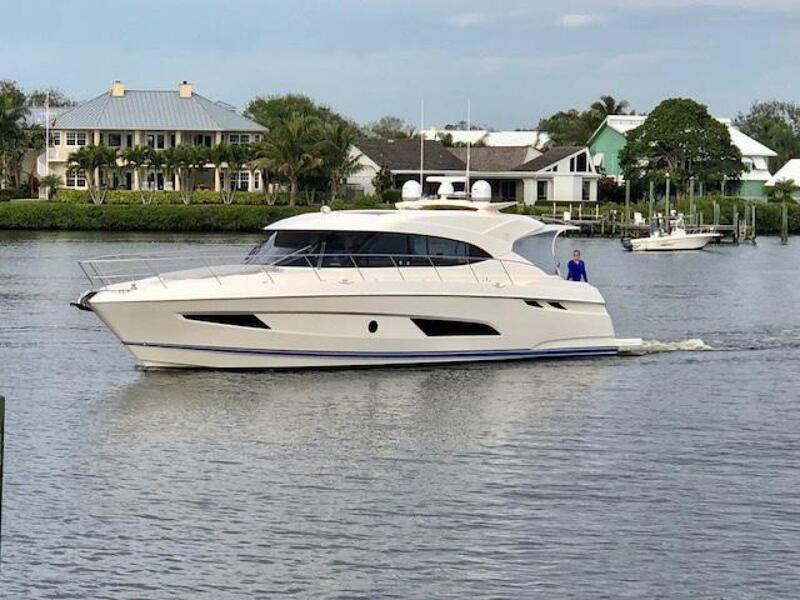 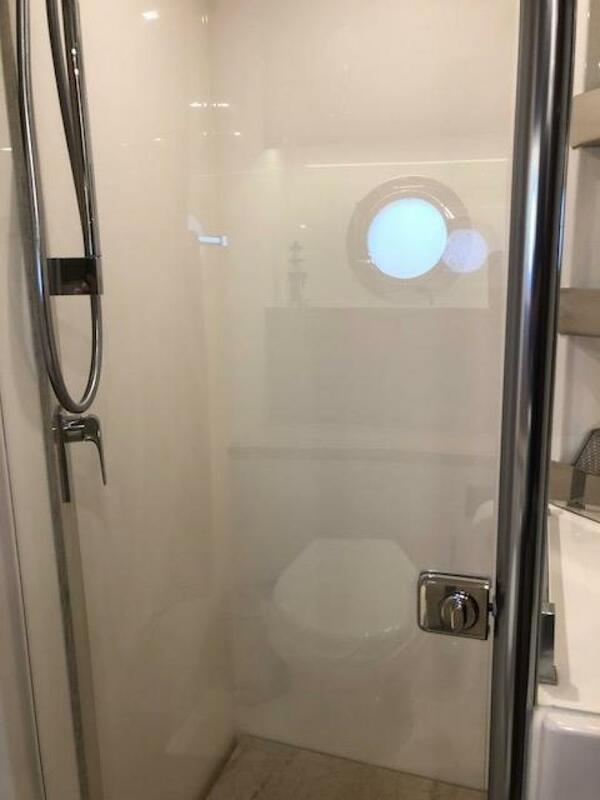 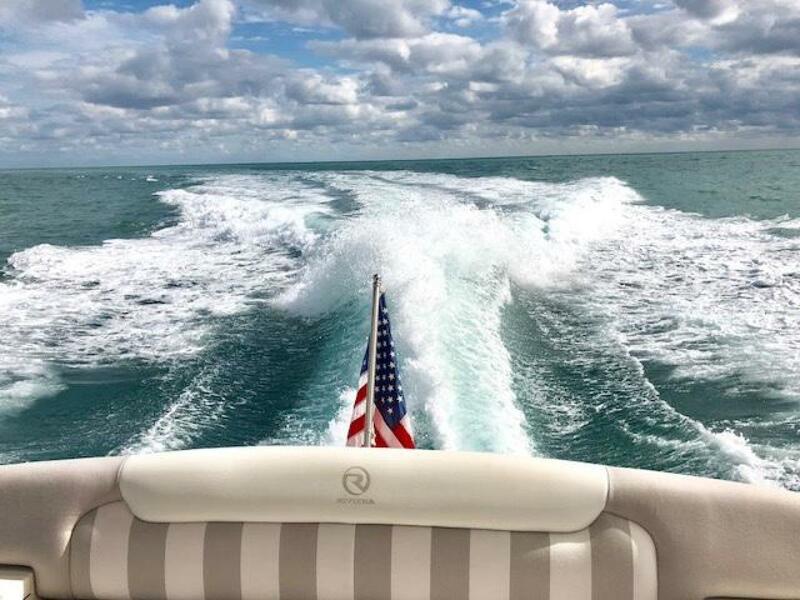 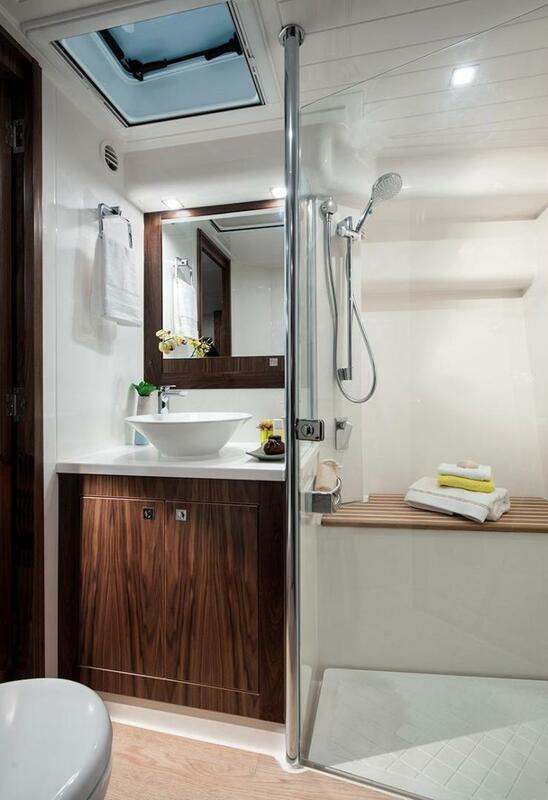 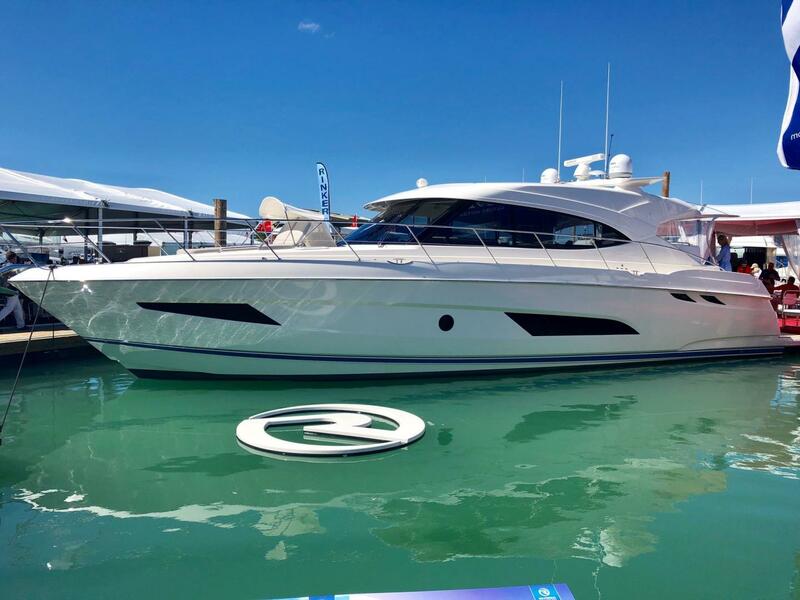 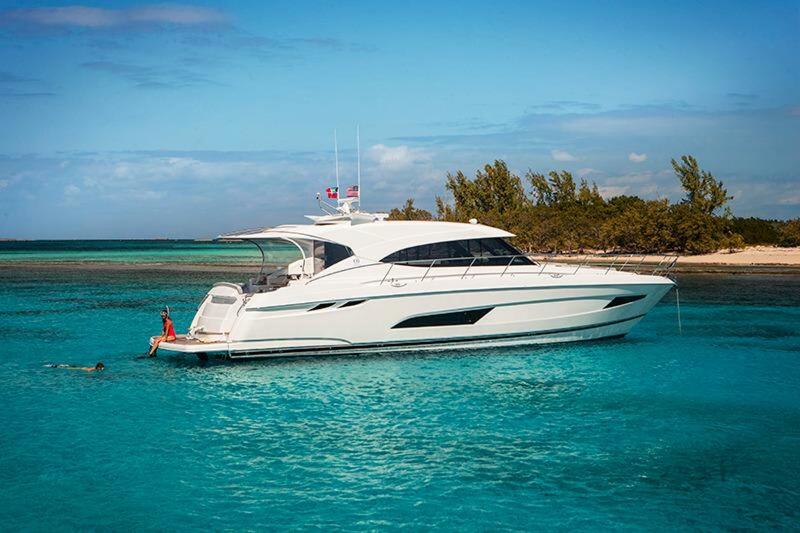 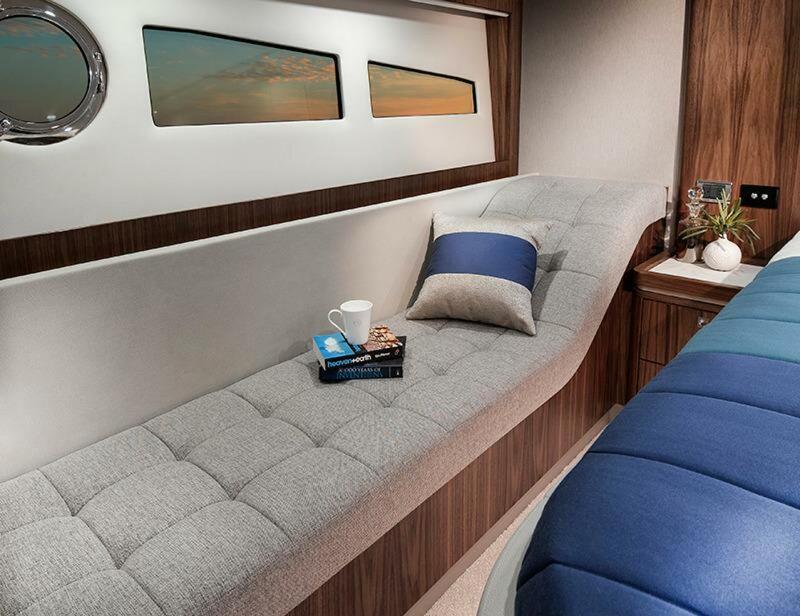 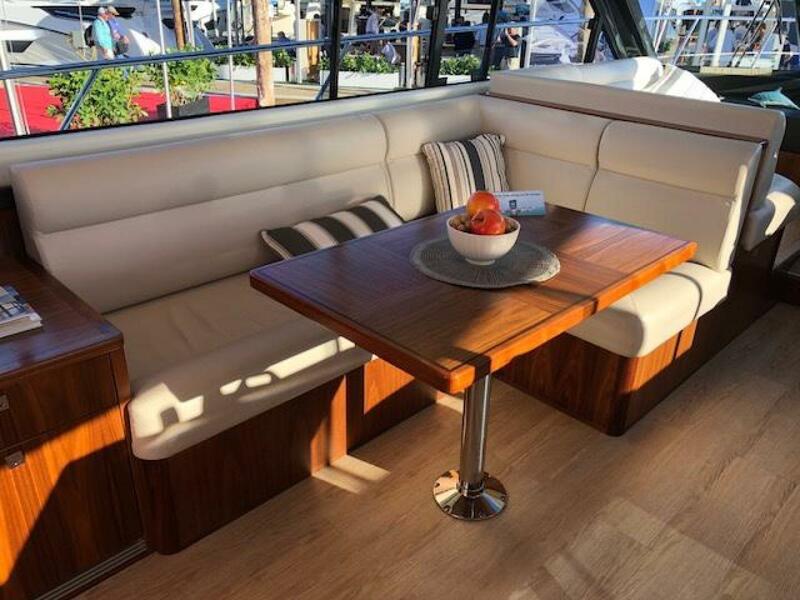 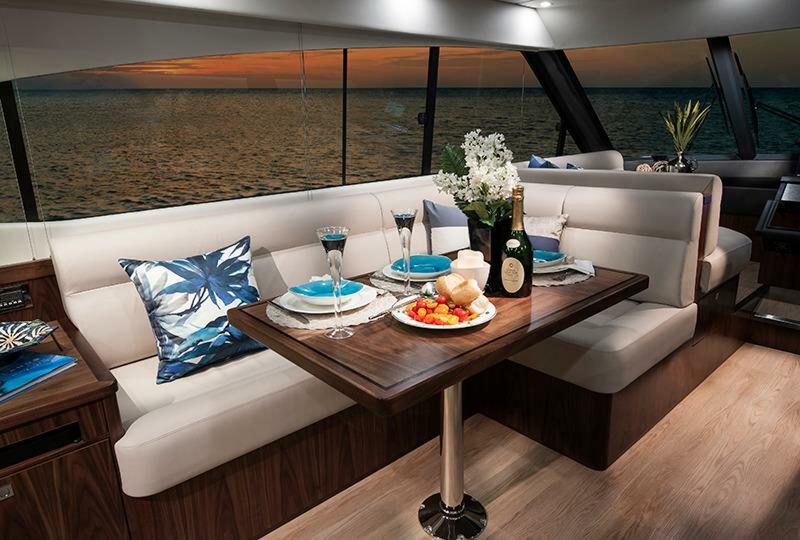 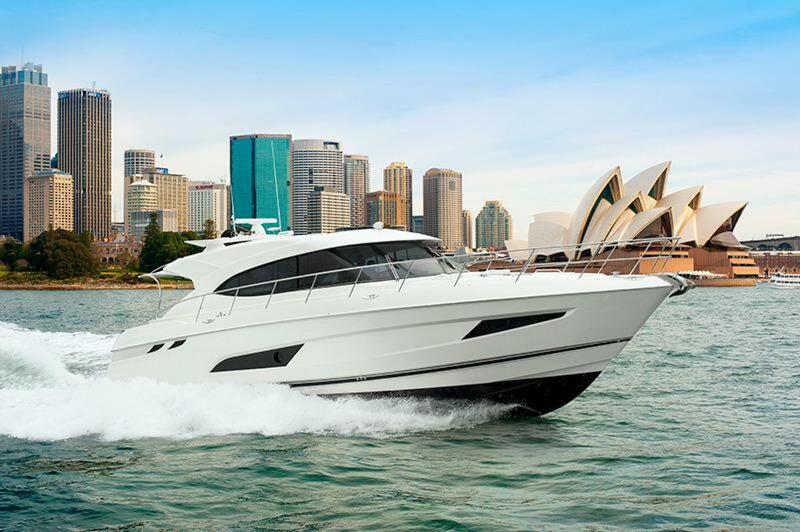 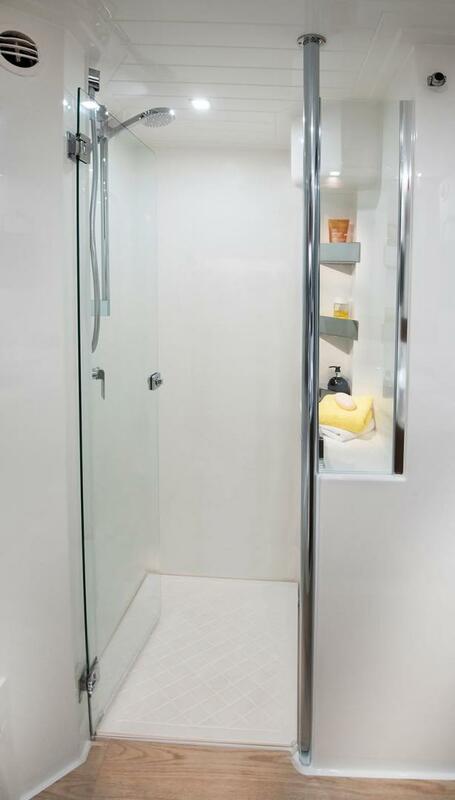 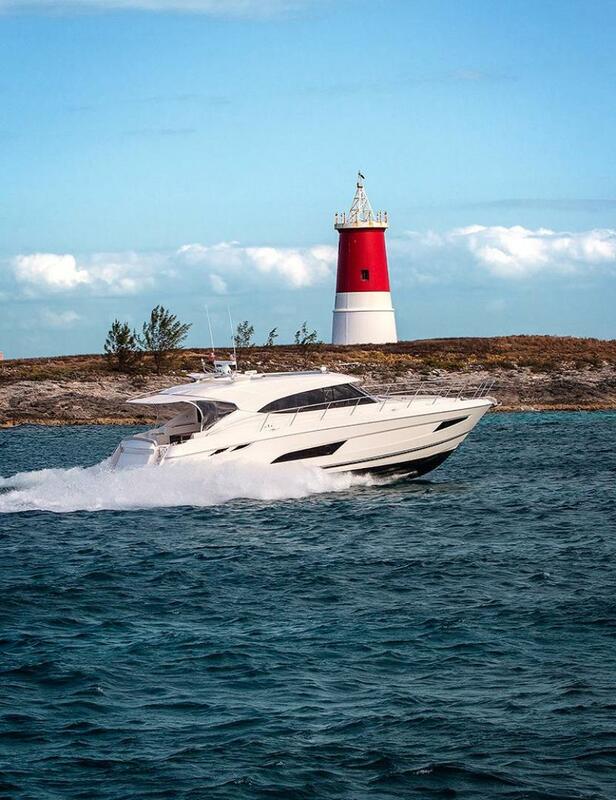 Even before you step aboard, you will notice that our talented Riviera team has created an entirely fresh design with a sleek new profile along with stylish hull windows and portholes, recessed for enhanced protection and aesthetic appeal. 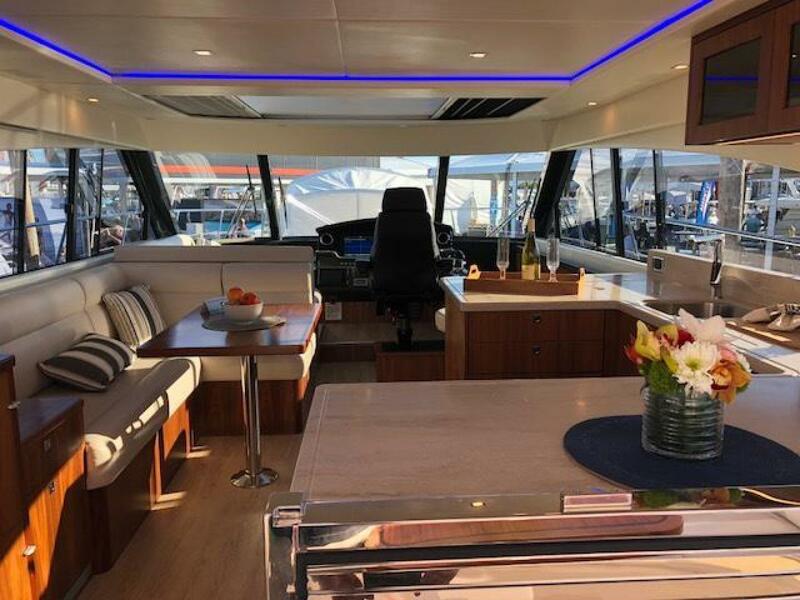 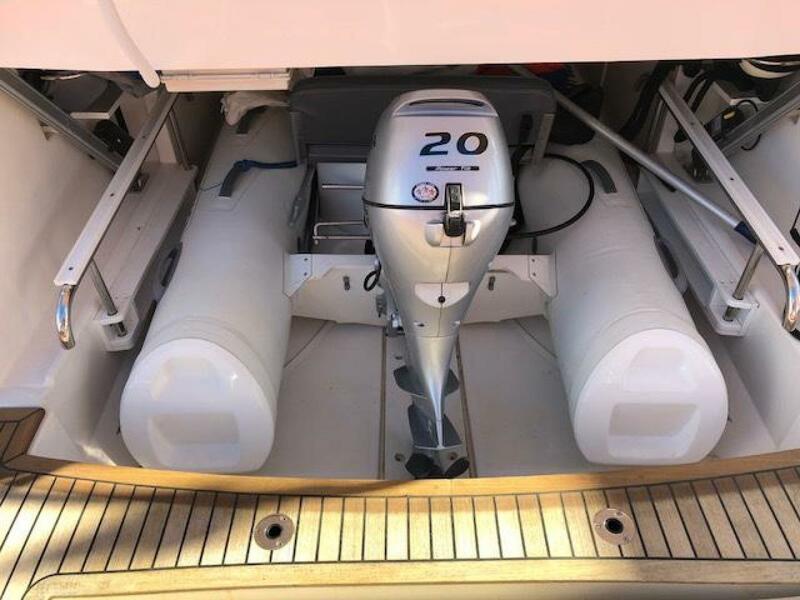 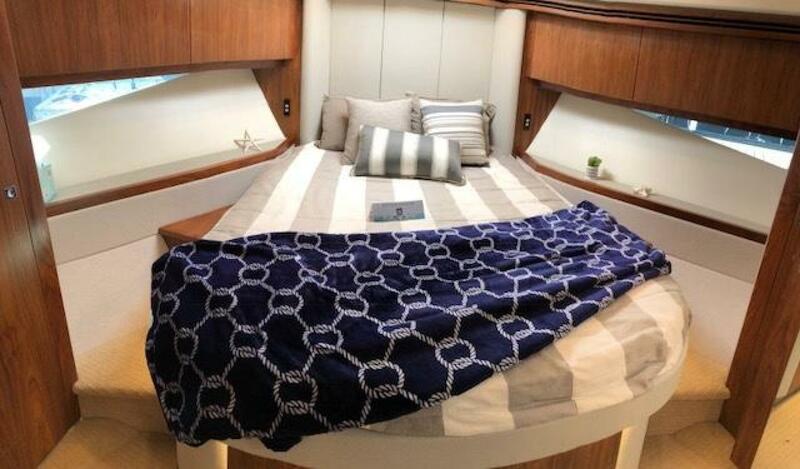 You will also notice that key design cues have been taken from the extremely popular 6000 Sport Yacht which has enjoyed considerable international success since her launch. 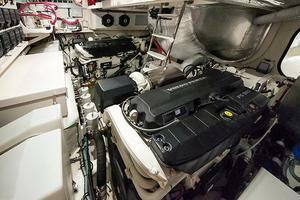 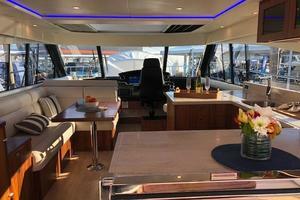 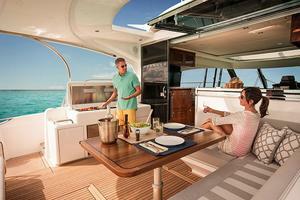 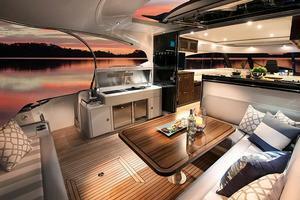 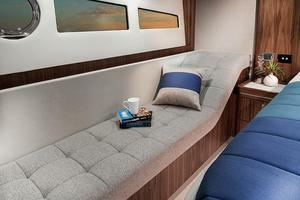 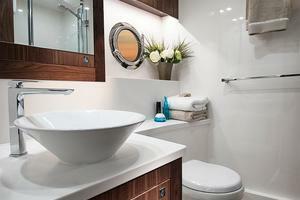 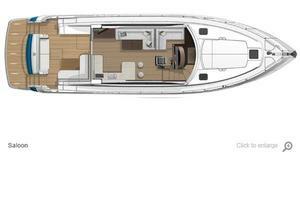 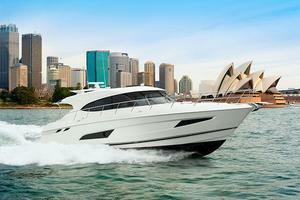 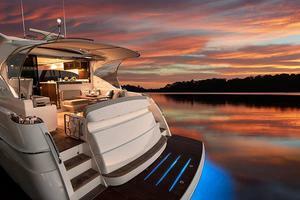 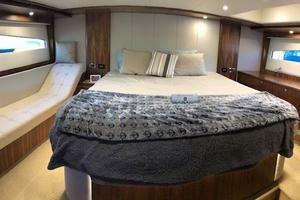 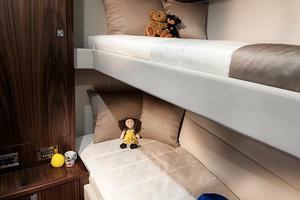 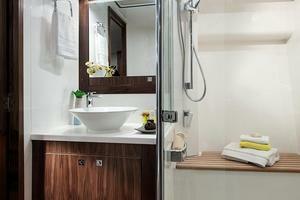 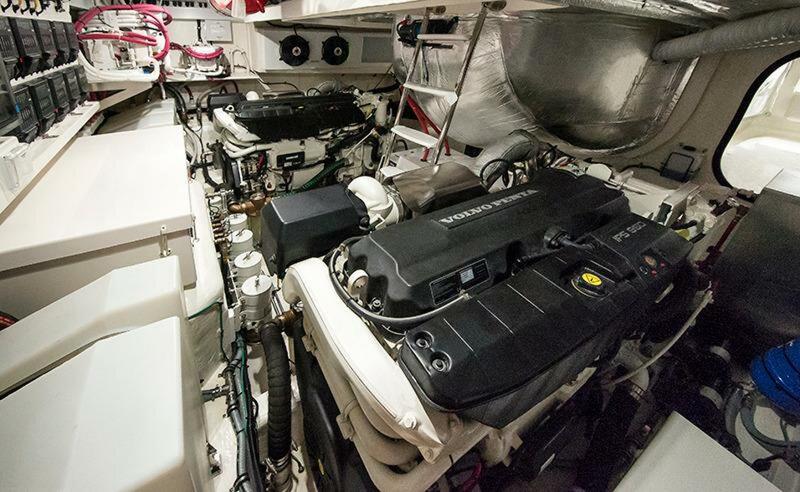 The 5400 genuinely abounds with spaciousness and this can only be fully appreciated when you step aboard. 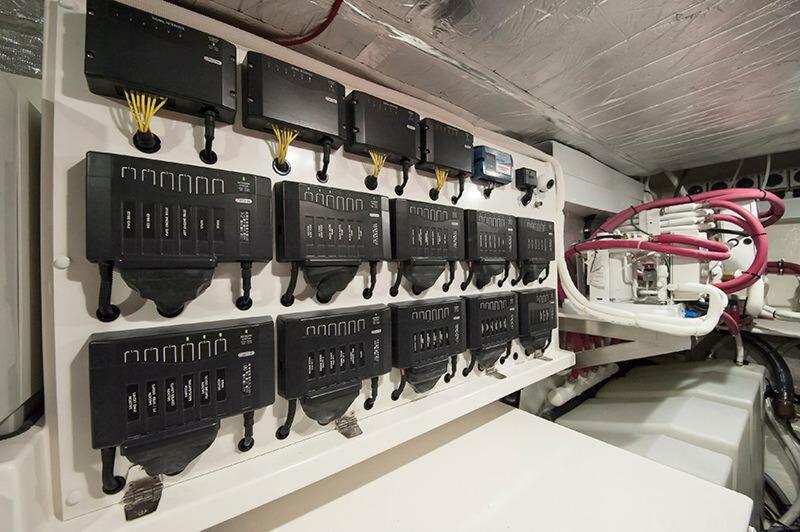 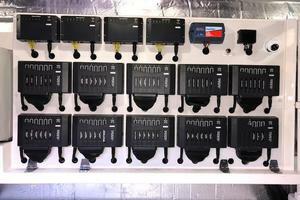 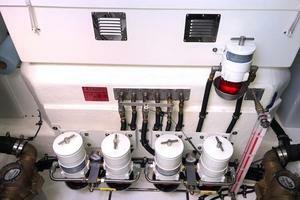 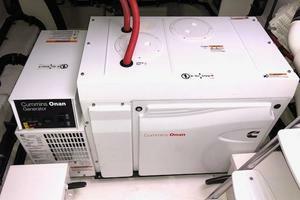 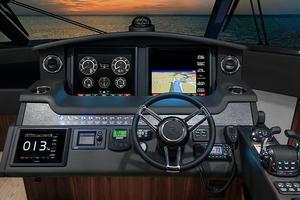 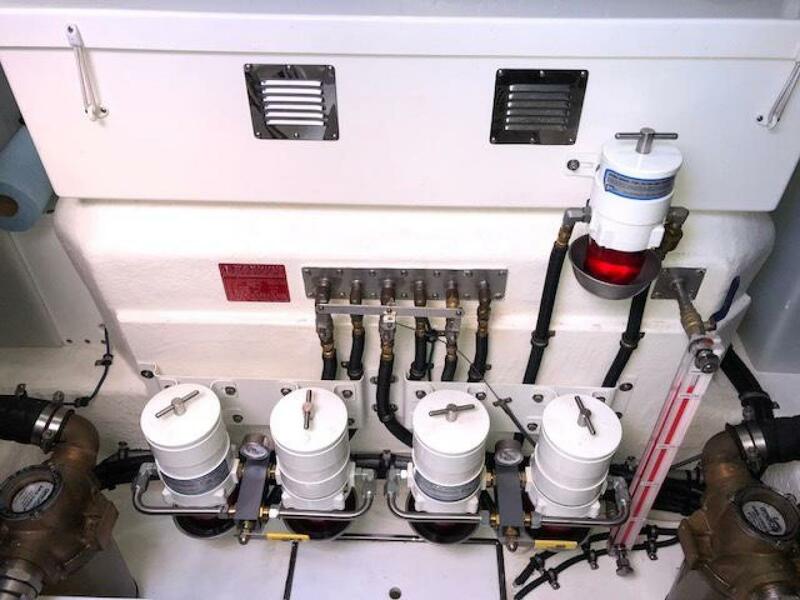 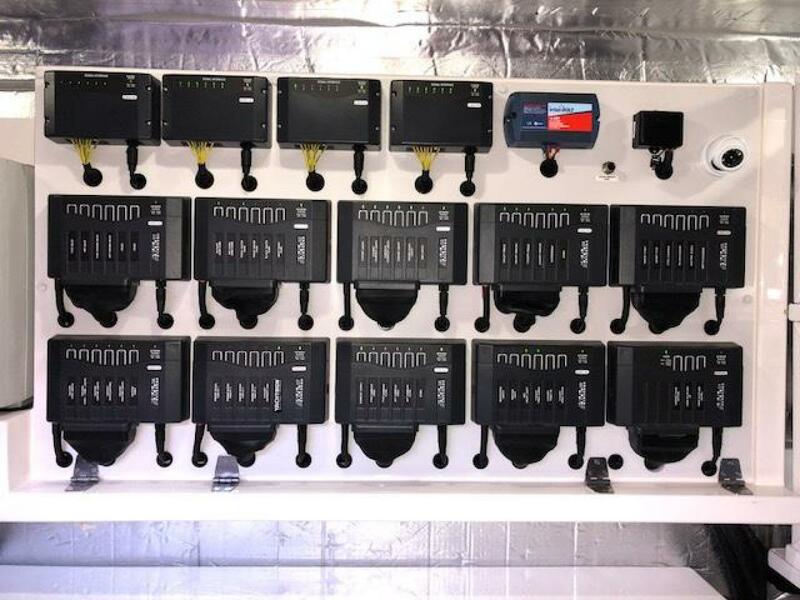 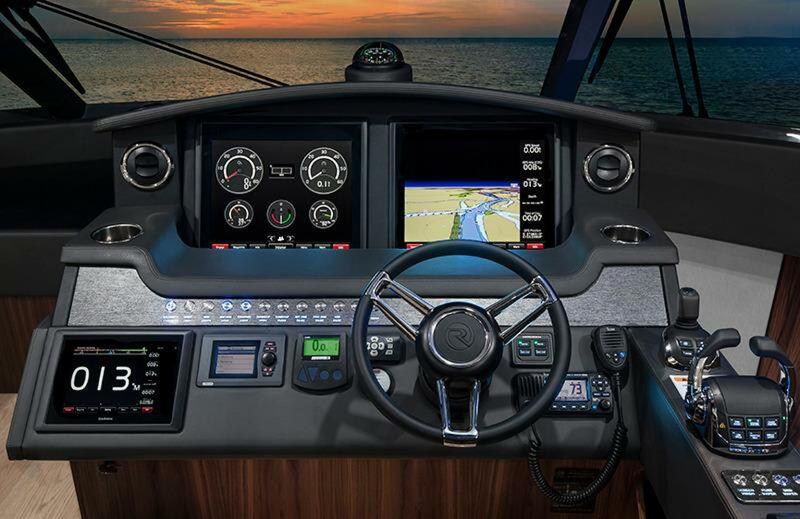 At once you will notice a vast array of new features, especially the sheer magnitude of the 5400’s internal volume. 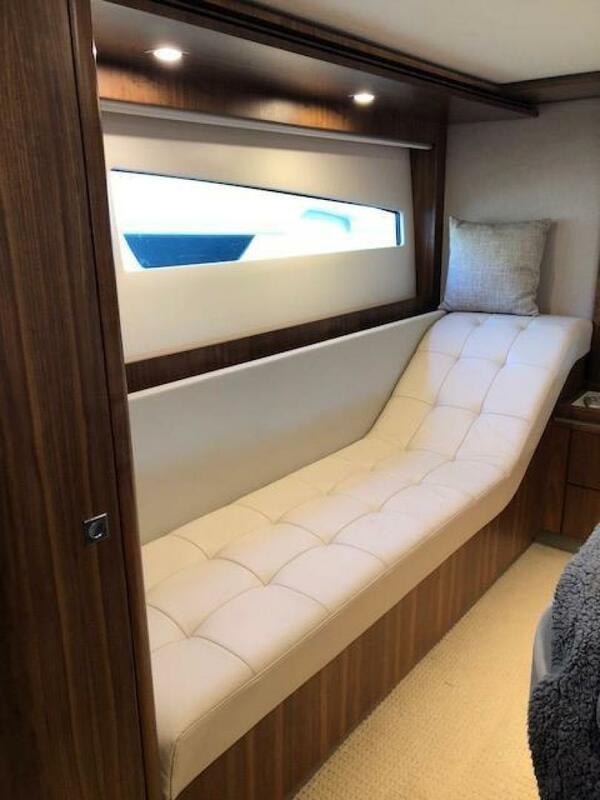 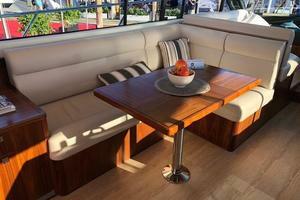 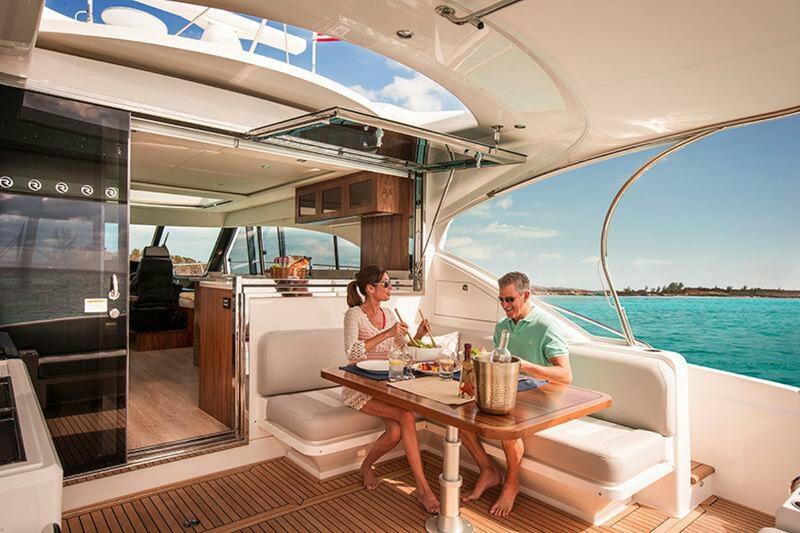 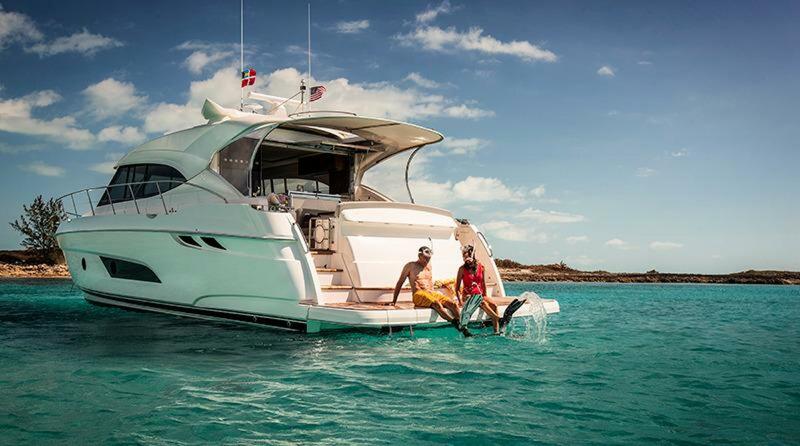 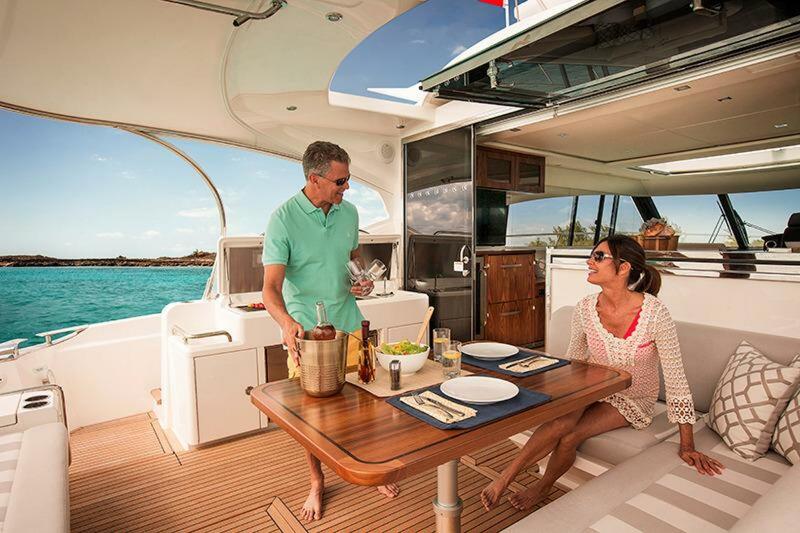 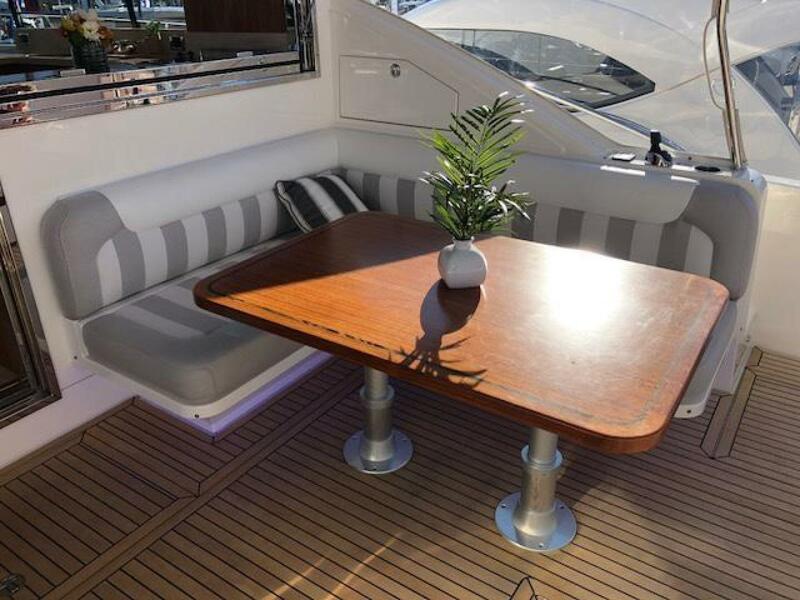 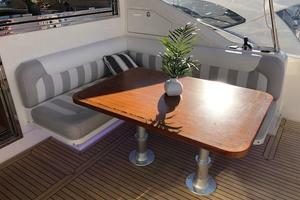 The 5400’s curvaceous fibreglass hardtop extends well aft to provide shelter and shade from the extremities, and houses the cockpit’s own electric sliding Webasto sunroof to bring extra sunlight and fresh air into the alfresco area when desired. 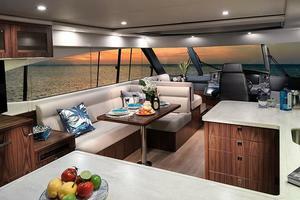 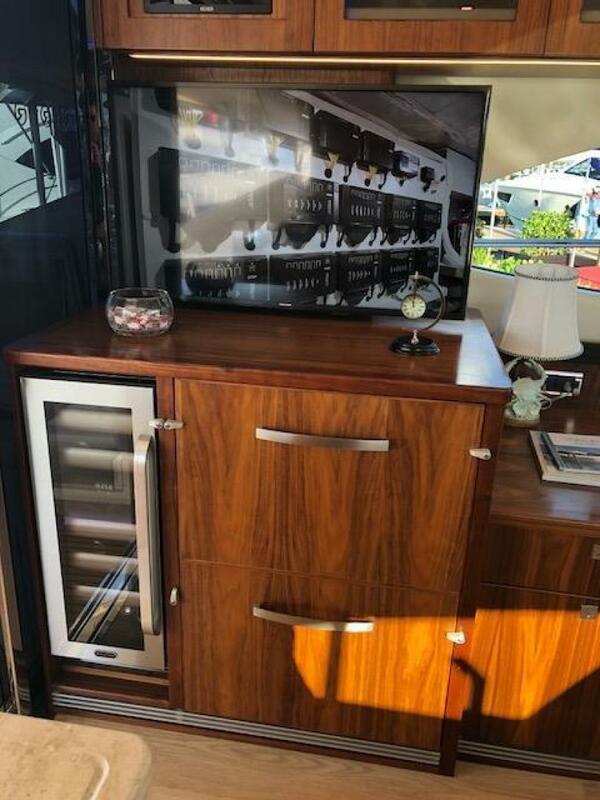 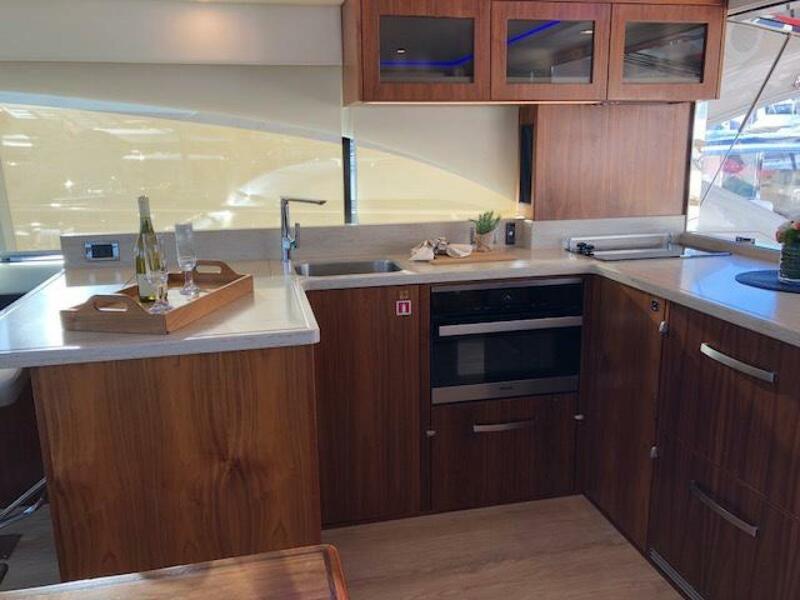 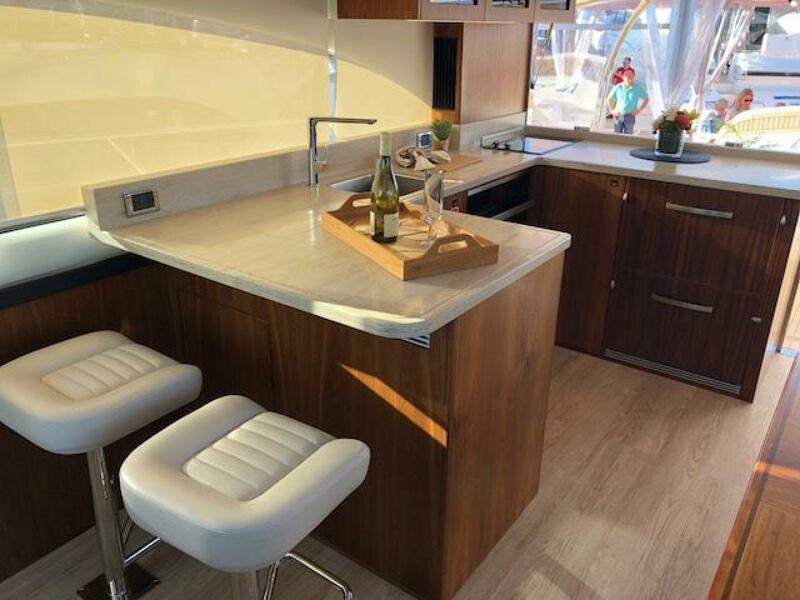 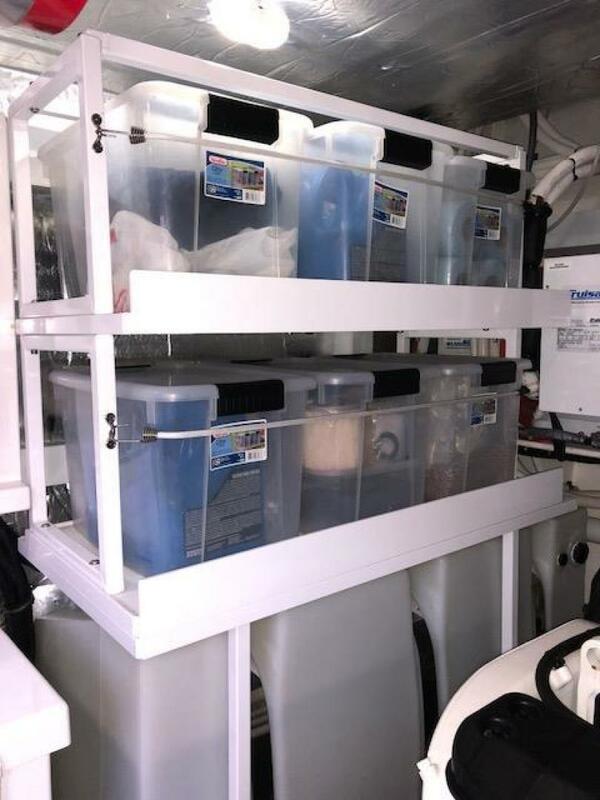 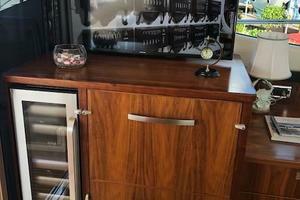 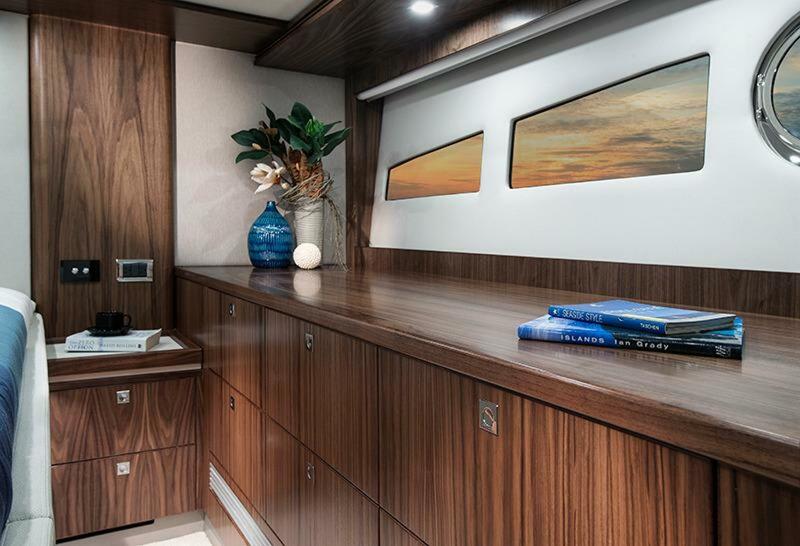 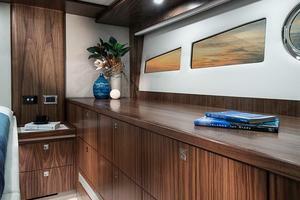 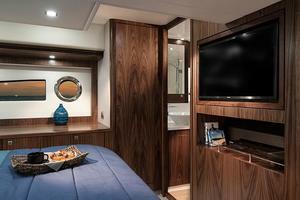 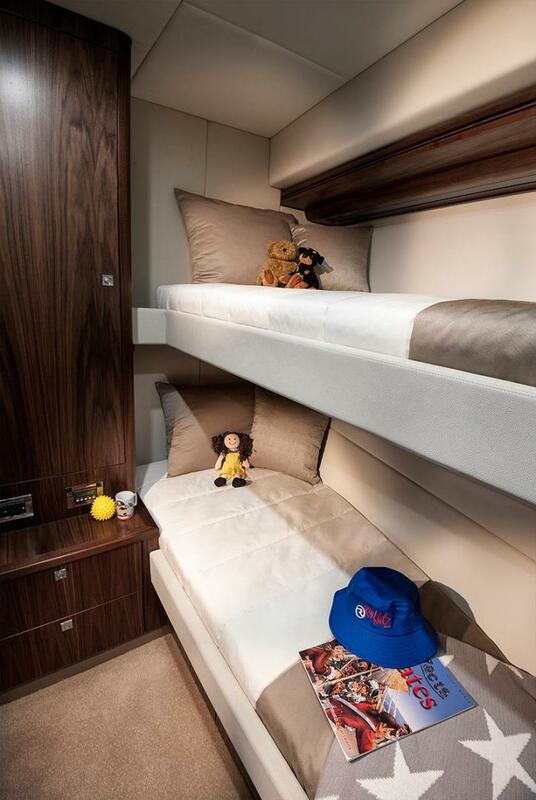 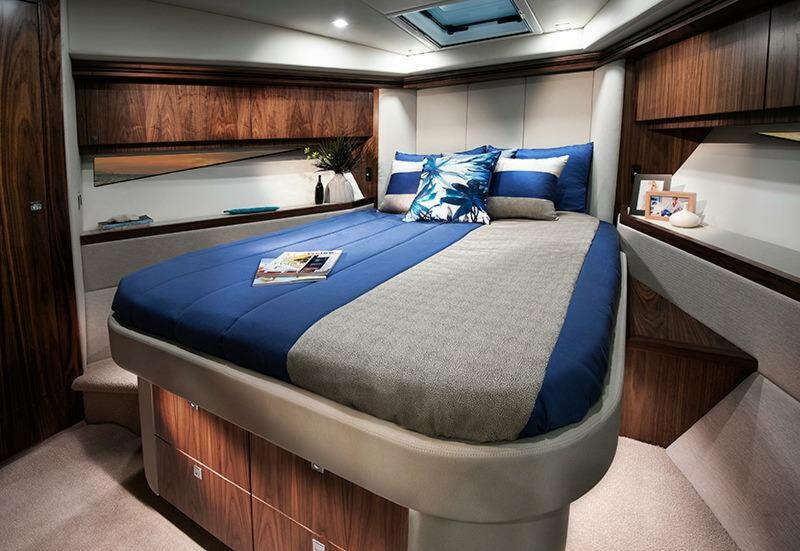 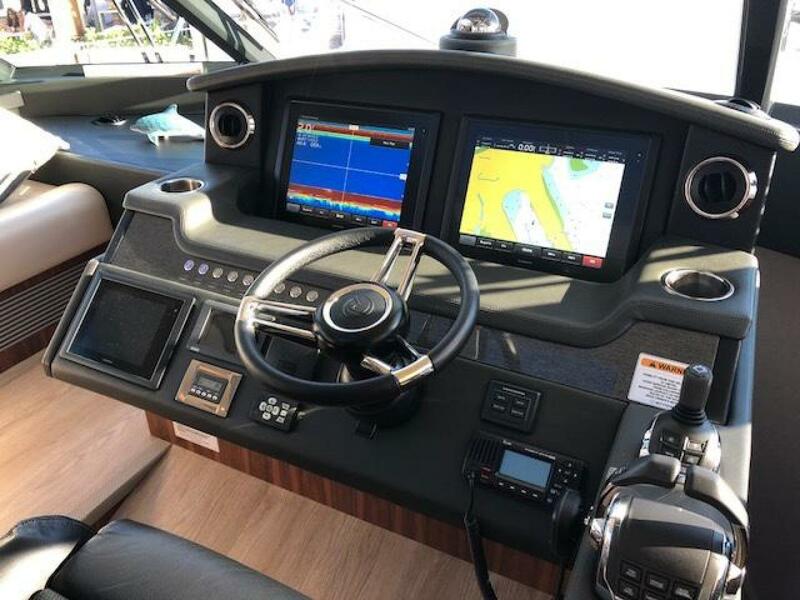 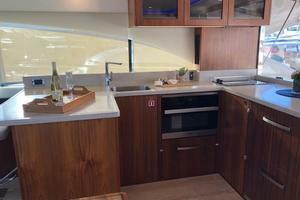 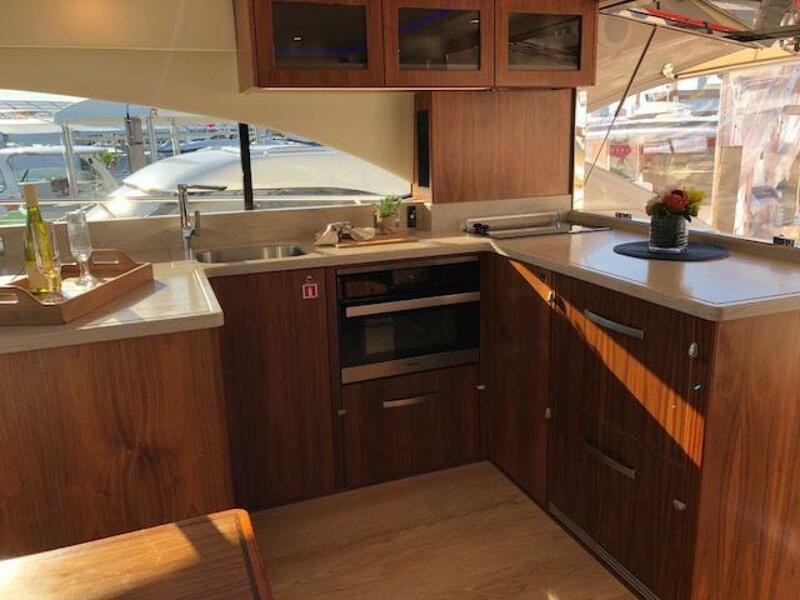 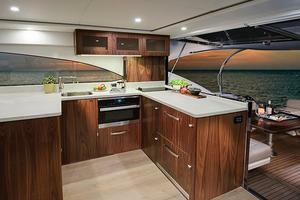 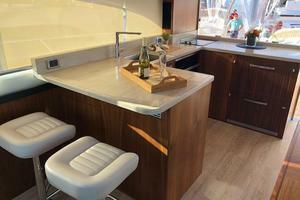 The 5400’s galley features the very latest in premium appliances and conveniences, complimented by varnished cabinetry with positive locking hardware for the drawers and cupboards. 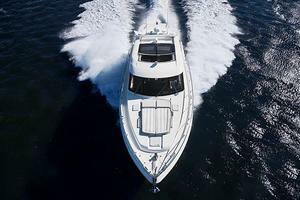 The confident poise of the 5400 Sport Yacht is just as evident offshore as it is at anchor – her solid and robust hull with keel is the evolution of our rich 35-year heritage of building almost 5200 world-class luxury motor yachts that are proven in the sometimes challenging Australian offshore conditions. 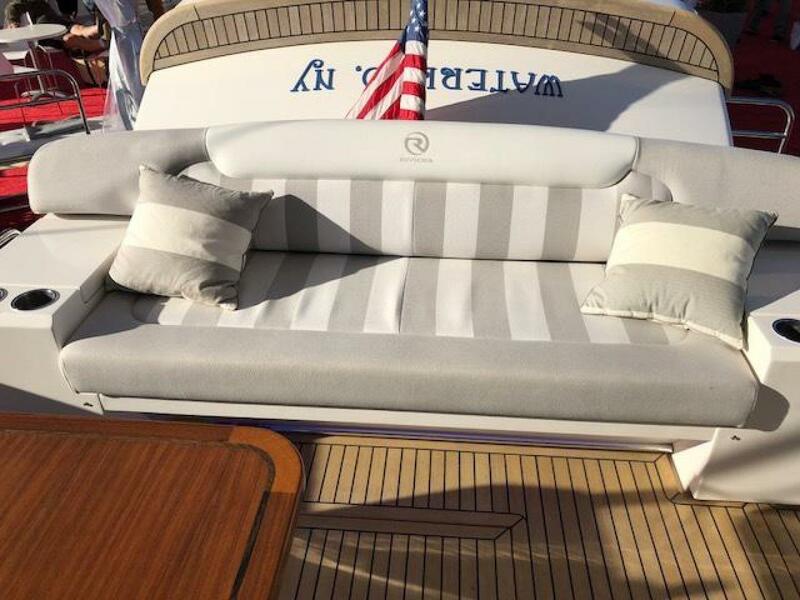 Additionally, two coats of epoxy undercoat and two coats of premium quality anti-foul paint is applied to every new Riviera before it leaves our factory. 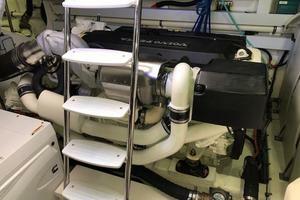 We even provide an additional litre of high-quality gelcoat with your new Riviera.